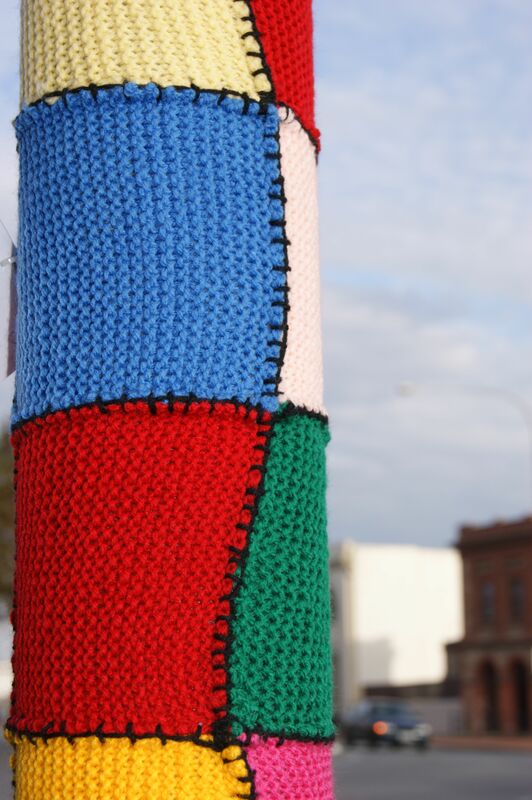 Yarn bombed crossing poles have been springing up around Port Adelaide. 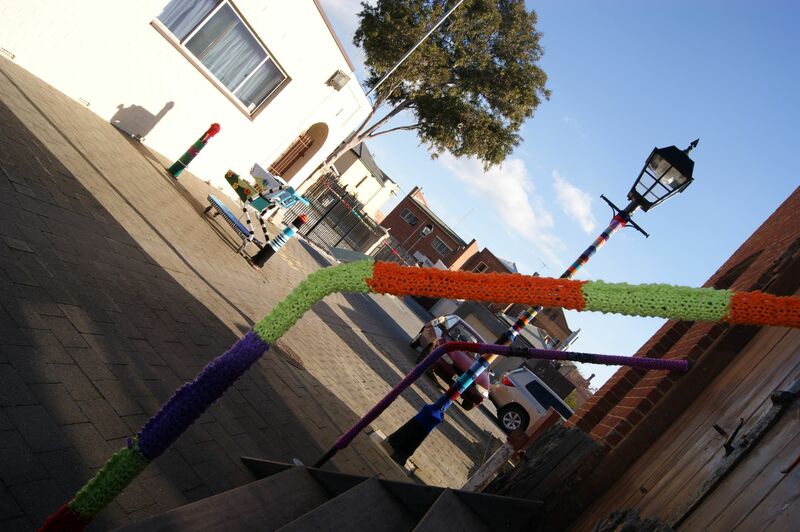 Some surprisingly colourful yarn bombing has been brightening up the poles out front of some of the shops in Port Adelaide. 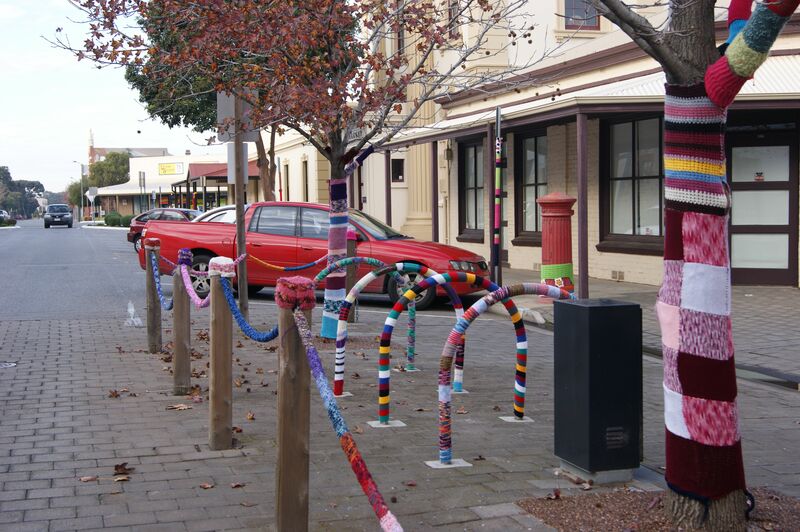 The whole community is passionate about street craft or street art. 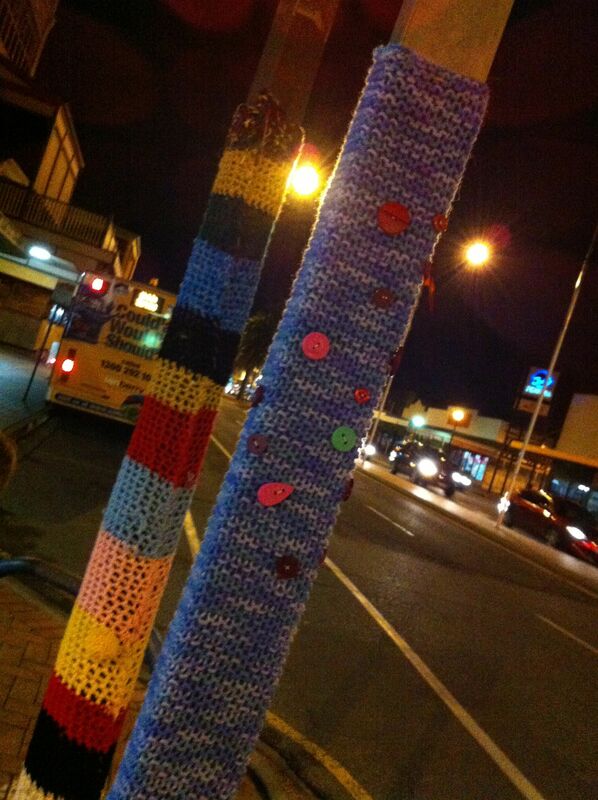 It’s amazing how many new yarn bombs have been quietly sewn onto poles in the night. 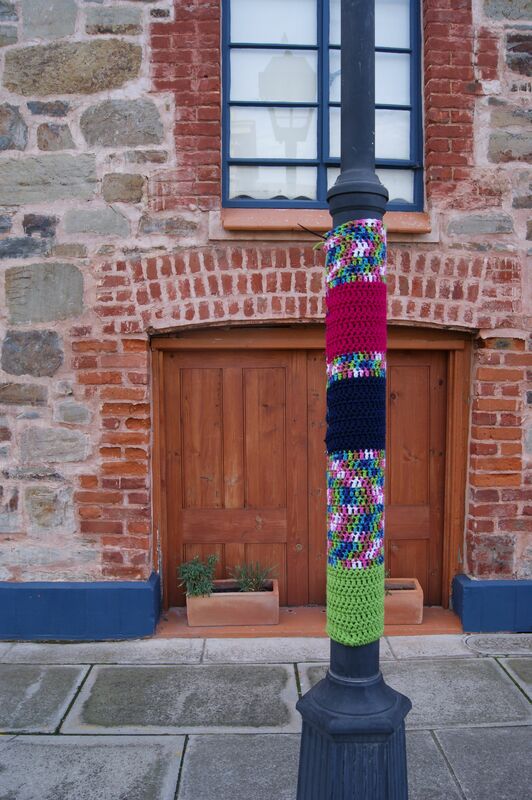 poles are the perfect canvas for yarn bombers who utilise knitting, crochet, pom-poms and even buttons. 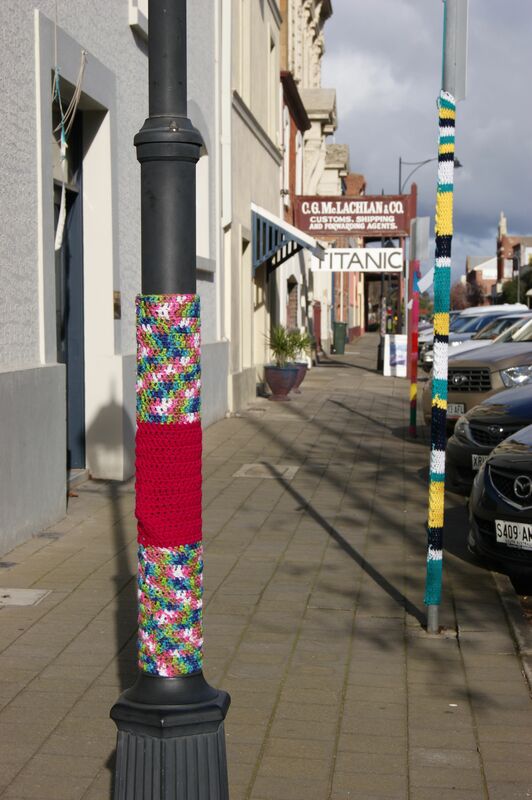 Striped yarn bomb poles, patch work poles, blue poles, red poles and rainbow coloured poles are flooding the world of friendly street art. 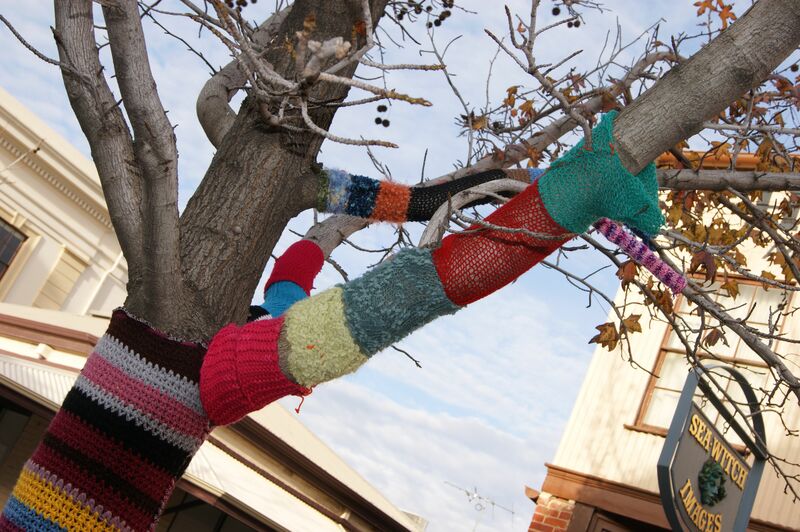 Yarn bombing is a great subject for photography whether snapped with camera or phone. 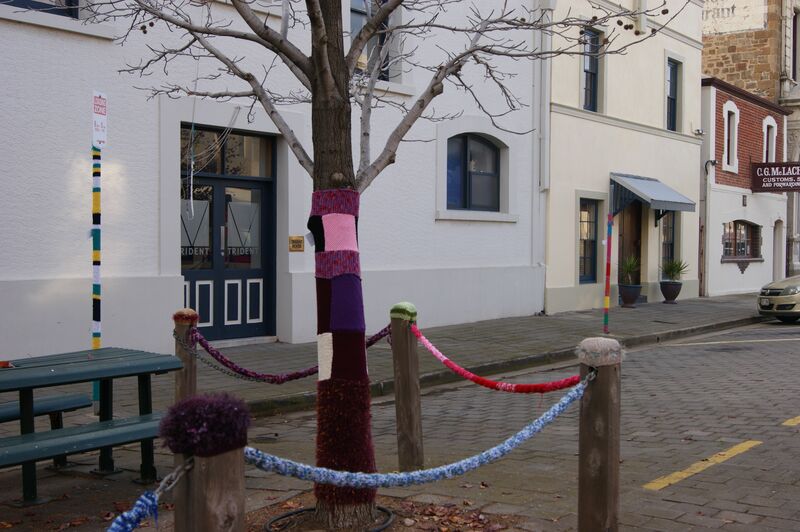 If you want to try your hand at yarn bombing and you don’t have the time to knit then you can sew a scarf to a pole or tie one around a mail box, pole or tree. 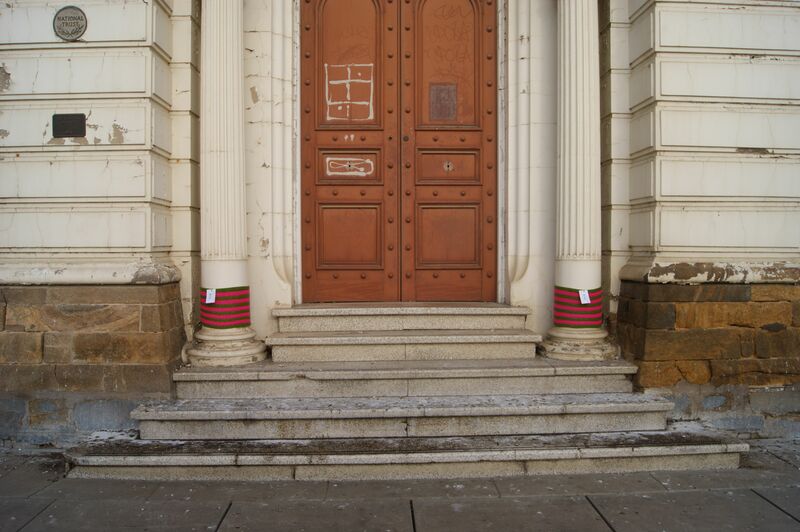 These yarn bombed pillars look rather majestic. 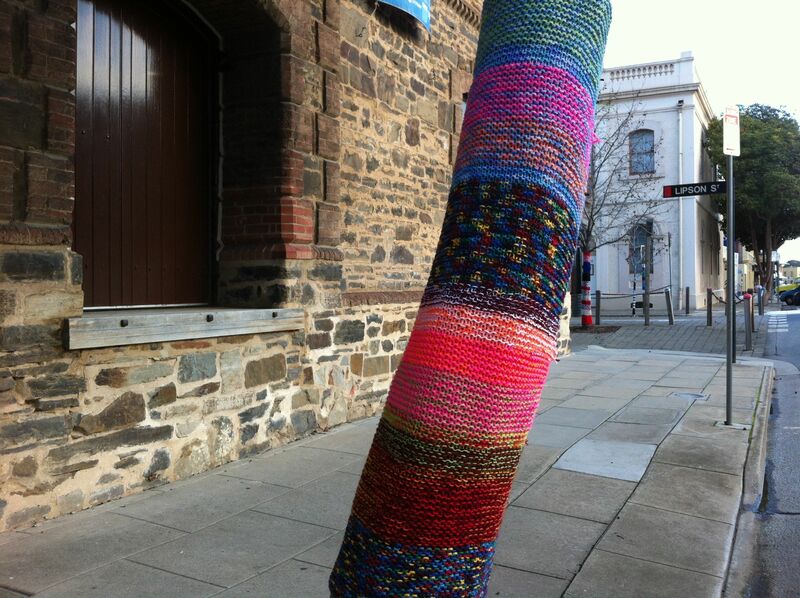 This entry was posted in crochet, knitting, Yarn bombing and tagged craft, knit, poles, port adelaide, scarf, street art, yarn bomb on June 29, 2012 by yarnbomb. 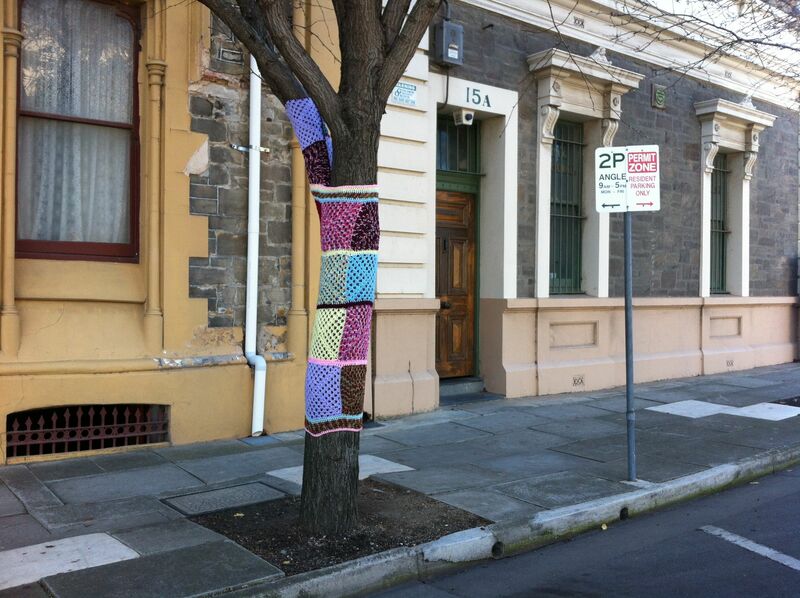 Yarn bombing is simply the art and craft of covering inanimate objects in knitting or crochet. 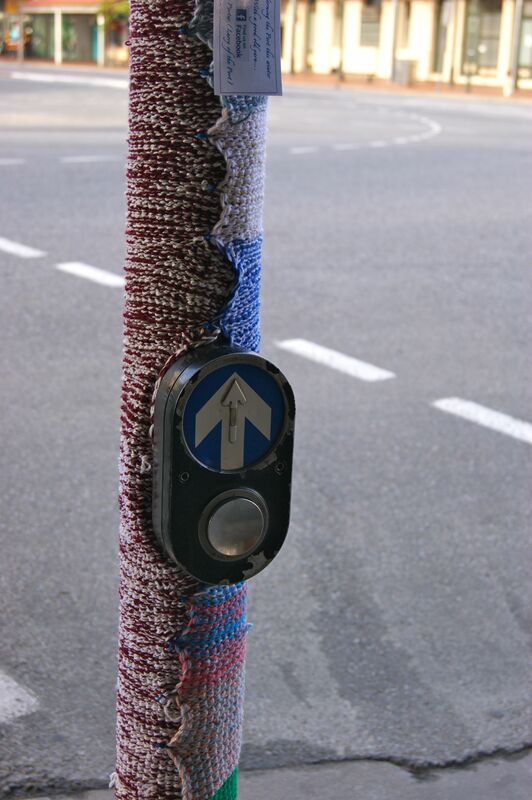 You can sew your knitted pieces to poles or you can attach it with cable ties. 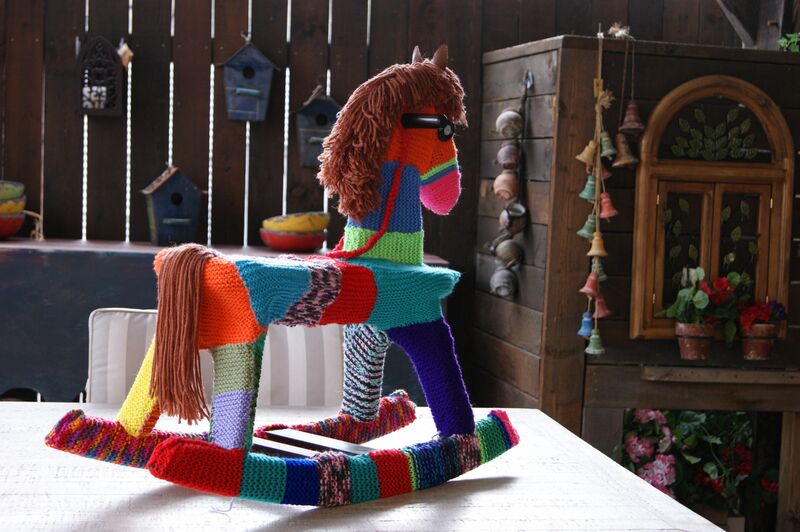 Knitting and crochet has had a renaissance in popularity recently. 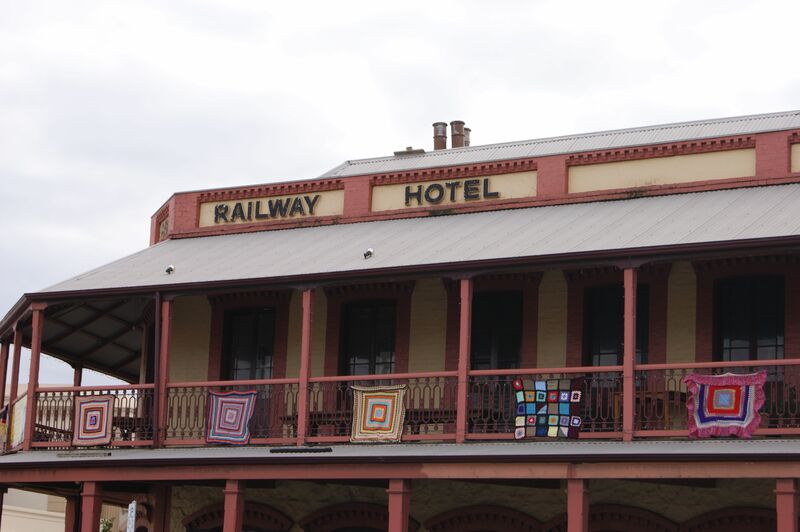 I’ve even spotted people knitting at the pub and on the train. 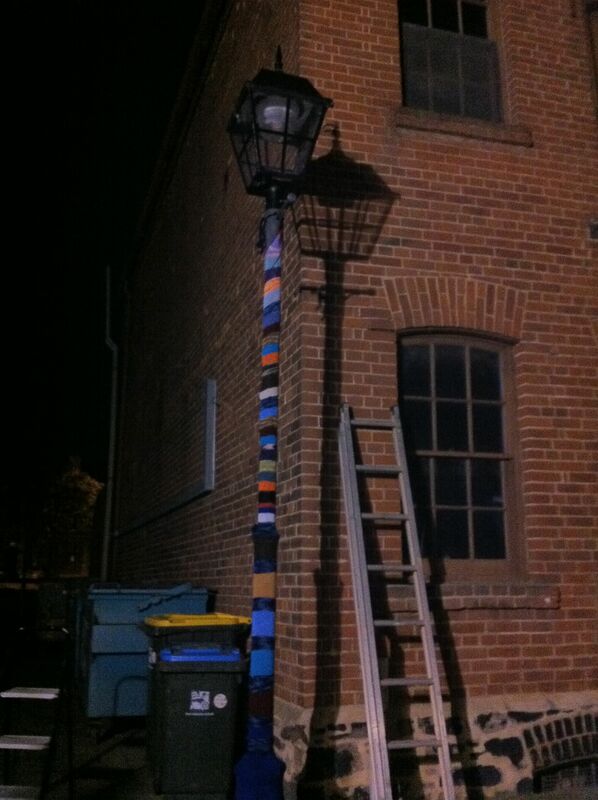 In the light of day yarn bombing is bright colourful and vibrant in the sun but at night you’ve got to shine a light on it. 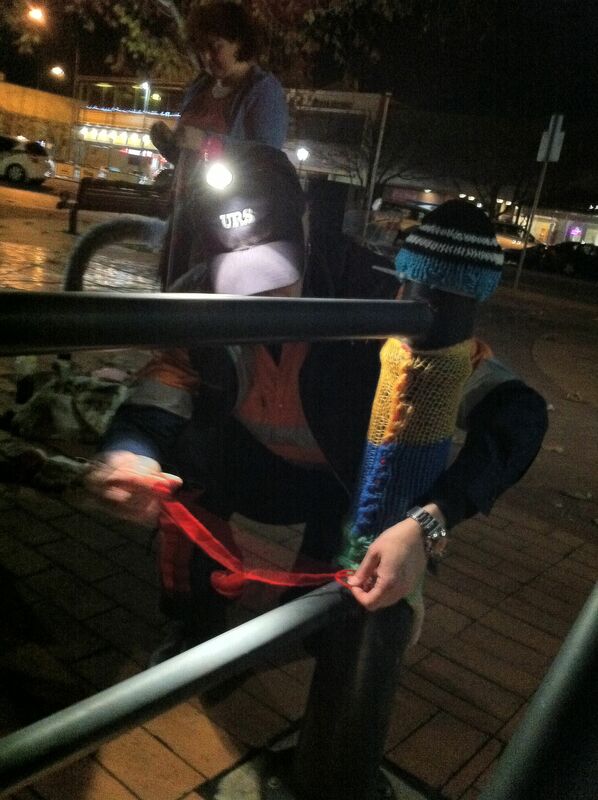 A lot of yarn bombing happens at night. 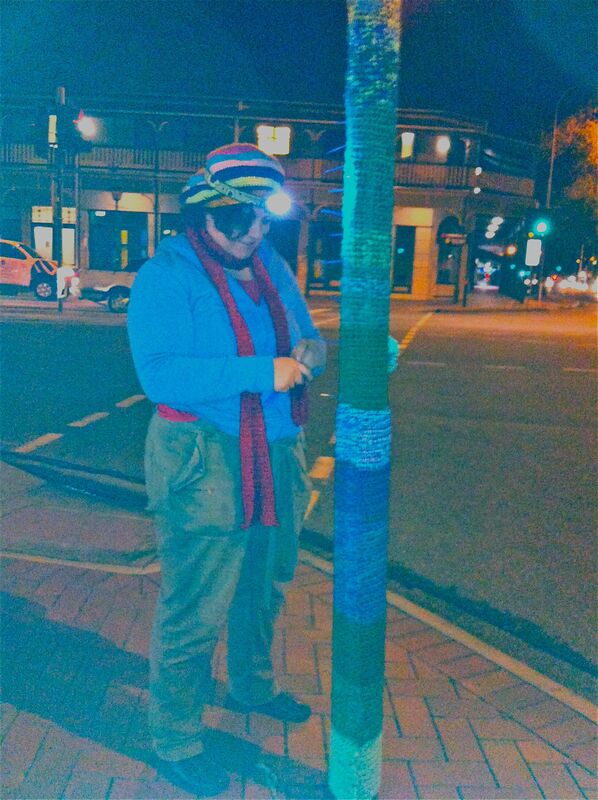 You can yarn bomb at night with a light on your head or a pocket torch. 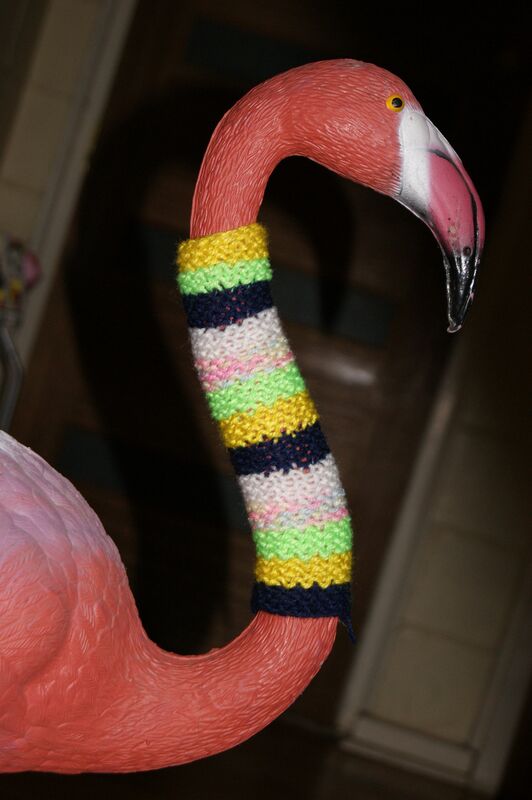 If you’re headed to a rave party afterward you could crack open your glow stick. 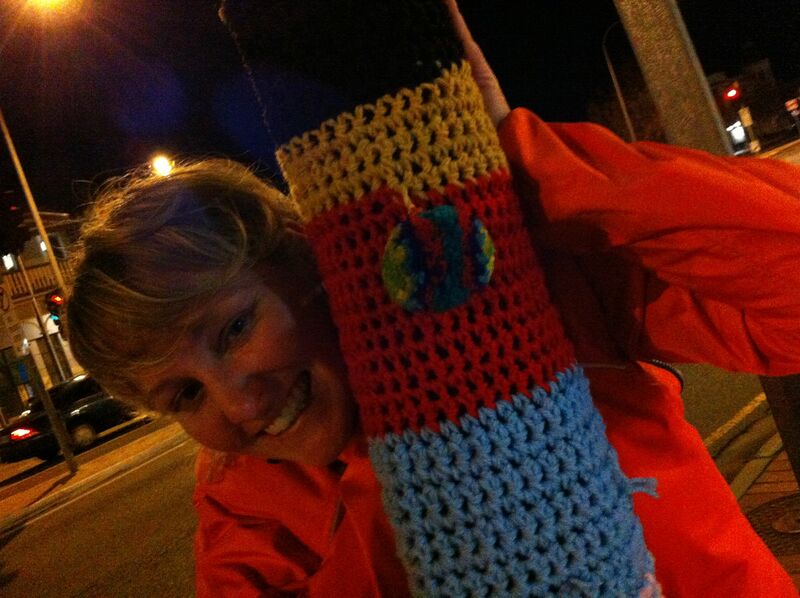 Or you can yarn bomb by the pale yellow of street lights and the headlights of passing cars and buses. 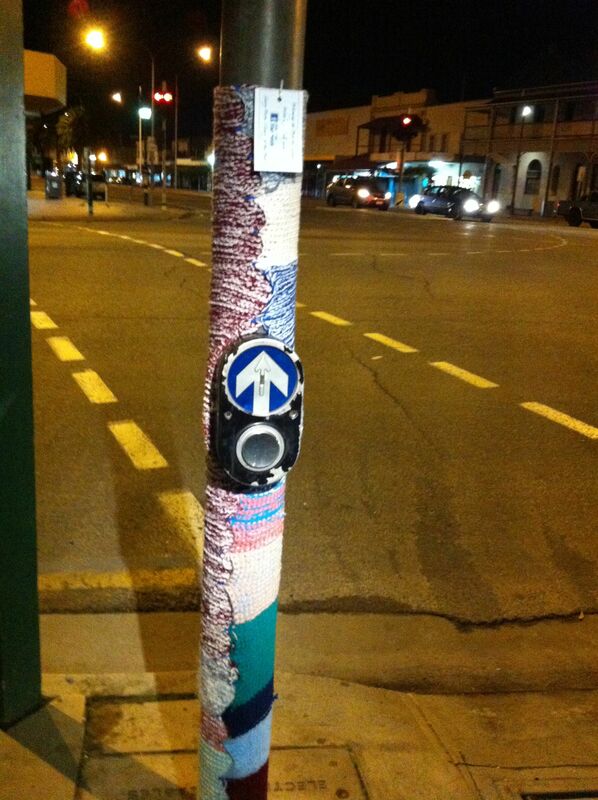 You won’t miss any street crossings in the night where yarn bombers have been at work. 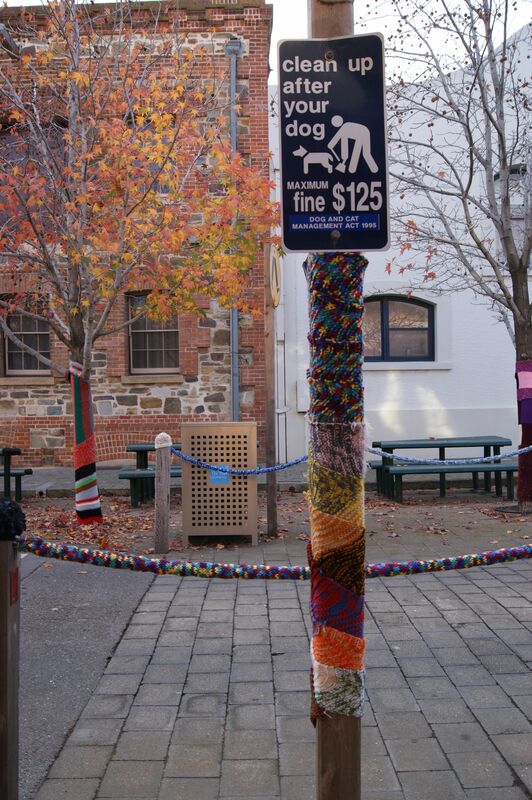 Be careful not to put your wooly scarf down when yarn bombers are near or it could get stitched to a pole. 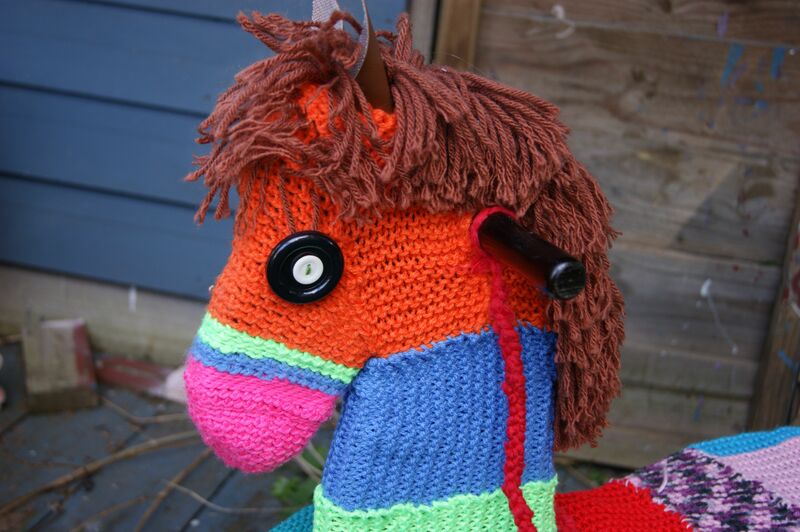 In the dark things can look a bit fuzzy and you don’t want to drop your sewing needle. 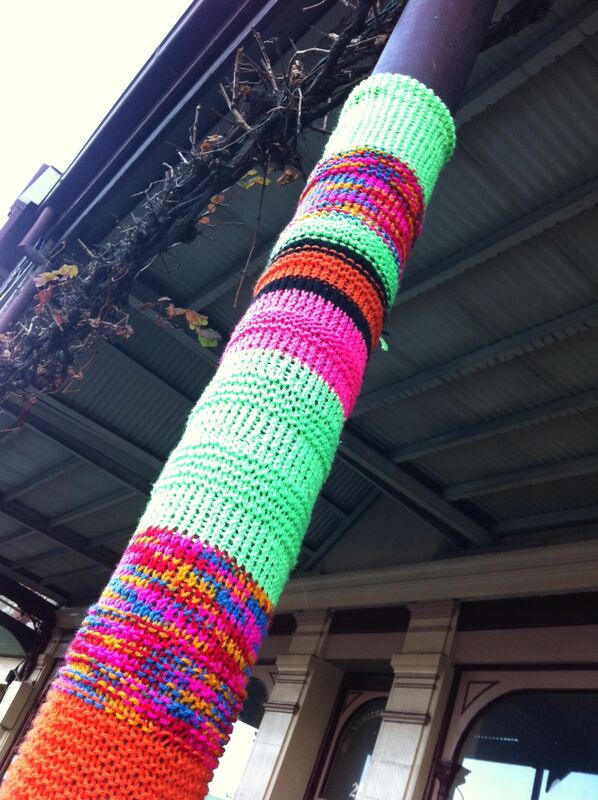 Wearing your fluorescent jackets or vests while yarn bombing will make you look like an official council worker and therefore people are less likely to ask you what on earth you are doing. 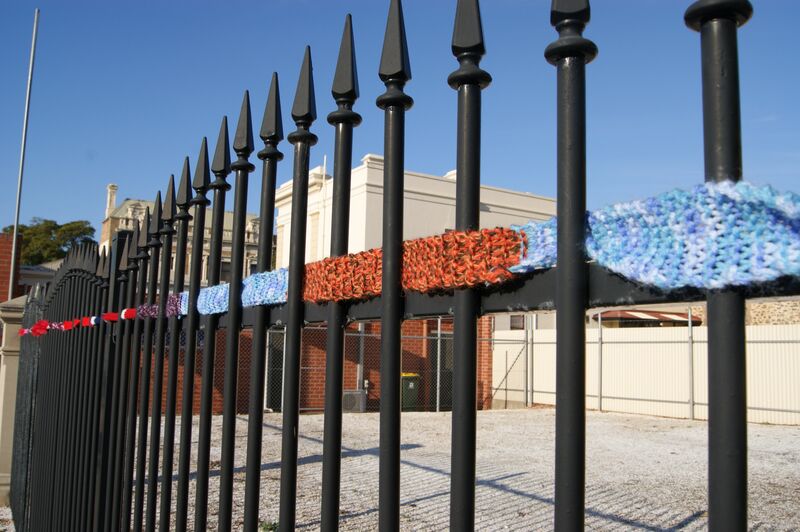 It’s always fun to go back to the scene of the yarn bombing in the light of day to take a look at how it looks in the sun and to check out if passers by are admiring you’re anonymous street art. 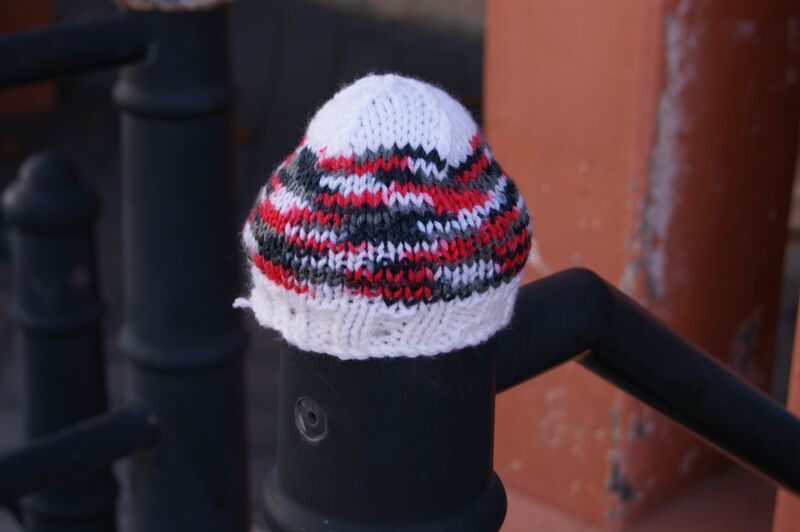 Often the little things such as a miniature hat on the top of a post can have a great impact because the finer details always make any craft project. 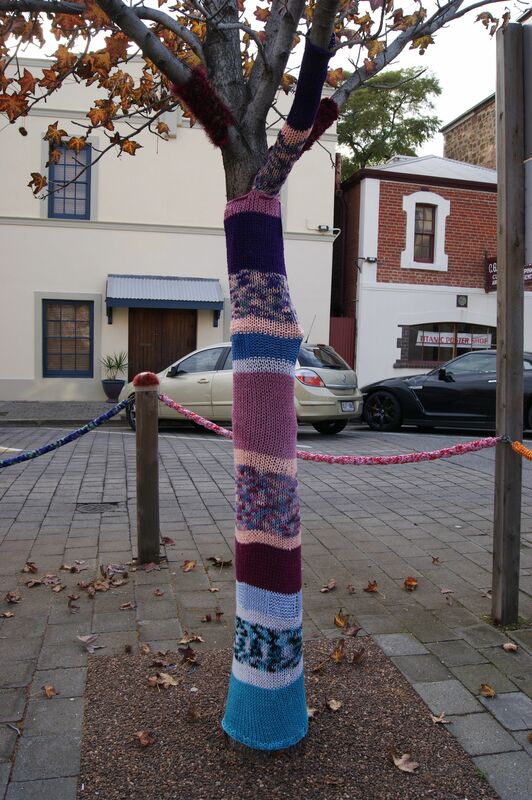 The great thing about yarn bombing is that you can yarn bomb anything. 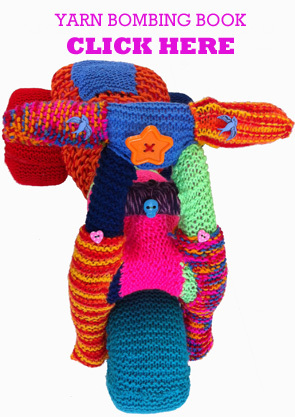 You can use knitting or crochet for yarn bombing a bike, a toy horse or a flamingo. 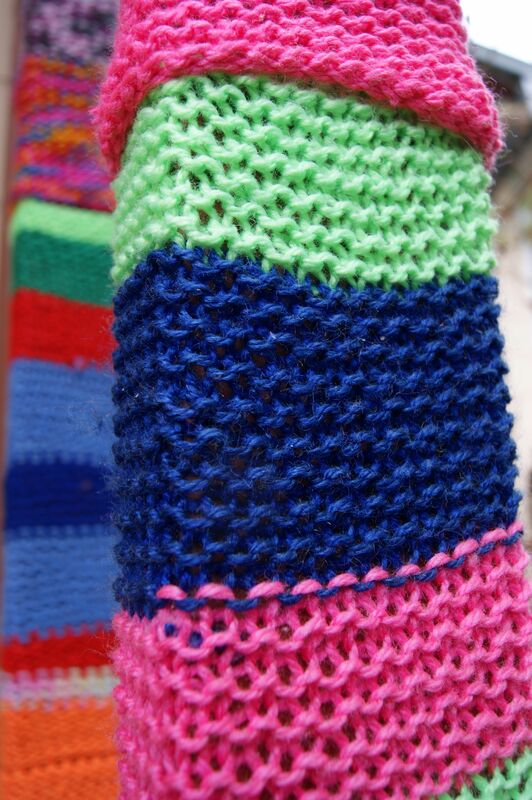 Yarn bombing is a great subject for fun photography with it’s vibrancy and texture. This entry was posted in crochet, knitting, Uncategorized and tagged art, craft, photography, sewing, street art, yarn bombers, yarn bombing on June 24, 2012 by yarnbomb. 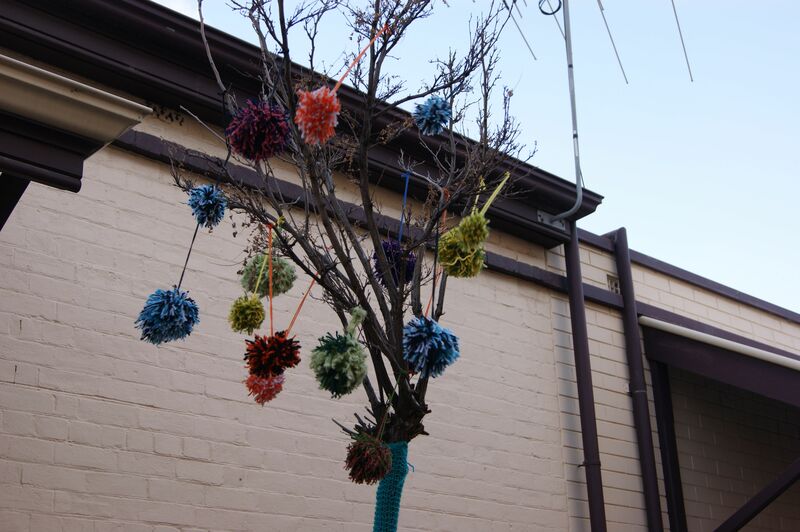 The yarn bombed tree’s in Port Adelaide have been garnering a lot of attention and the local children love them so much that they have been making pom-poms to hang on them. 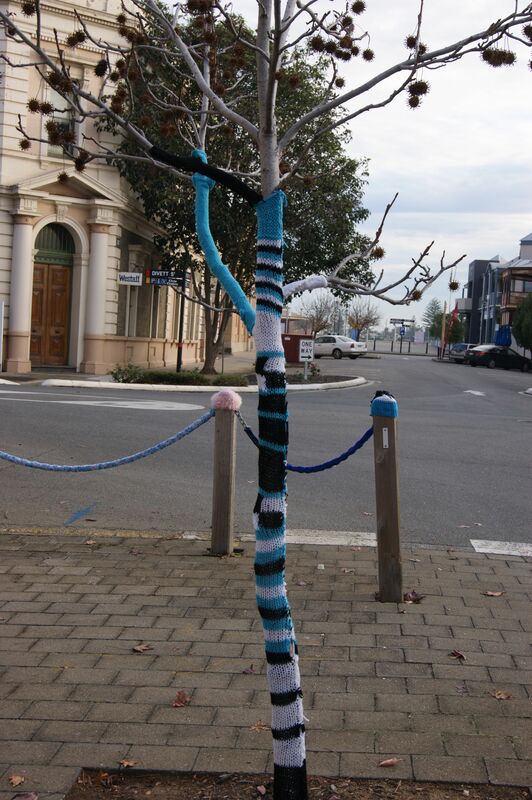 This lovely tree is yarn bombed with delicate crochet by a mystery street artist who was inspired by the Port Adelaide yarn bombing crew headed by auntie Pearl. 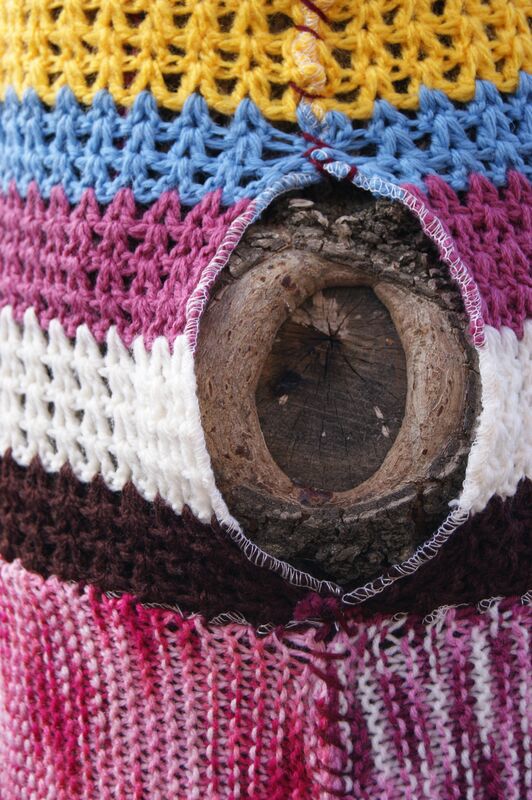 This tree has a little peep hole to look out on the world with. 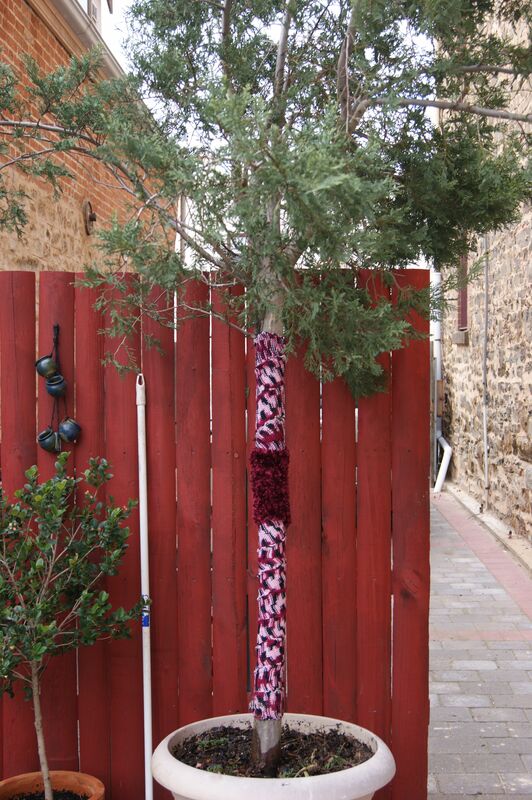 This tree has been yarn bombed with strategic colours that match the fence behind it and it seems perfect for photography. 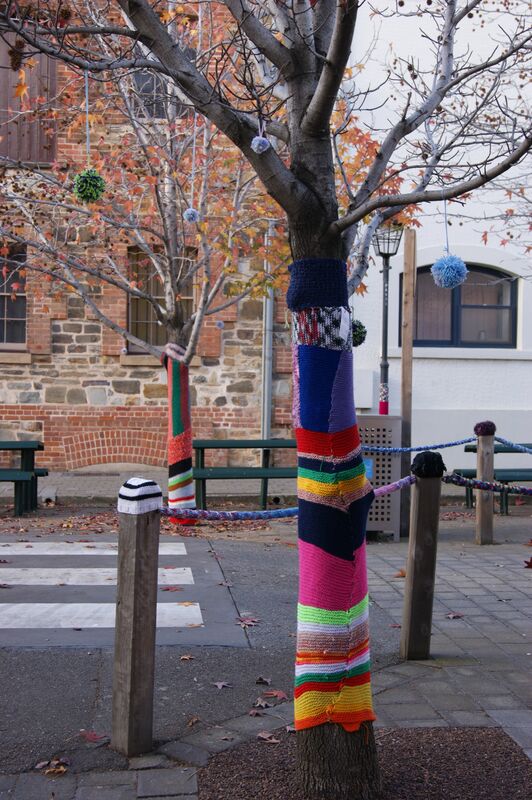 These yarn bombed tree’s are swathed in multi-coloured knitting. 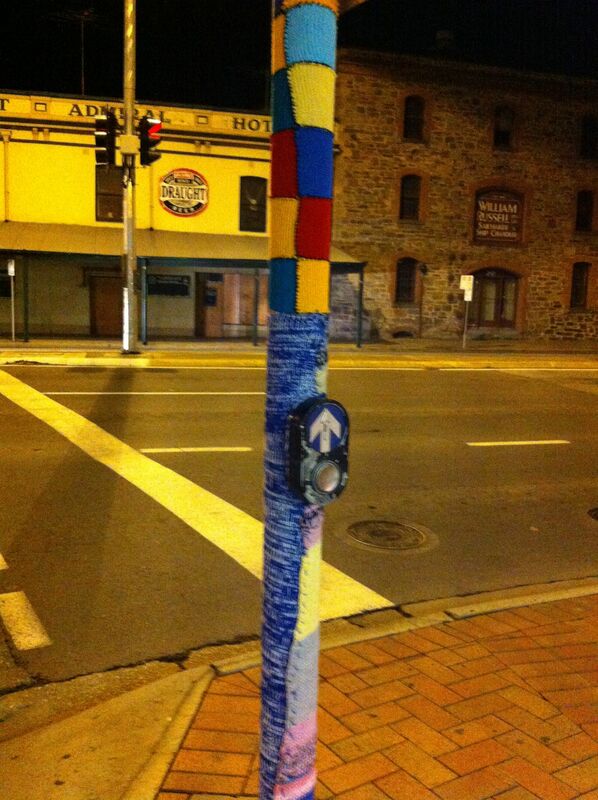 Yarn bombing in Port Adelaide has really taken off in popularity and it’s even becoming a bit of a tourist attraction. 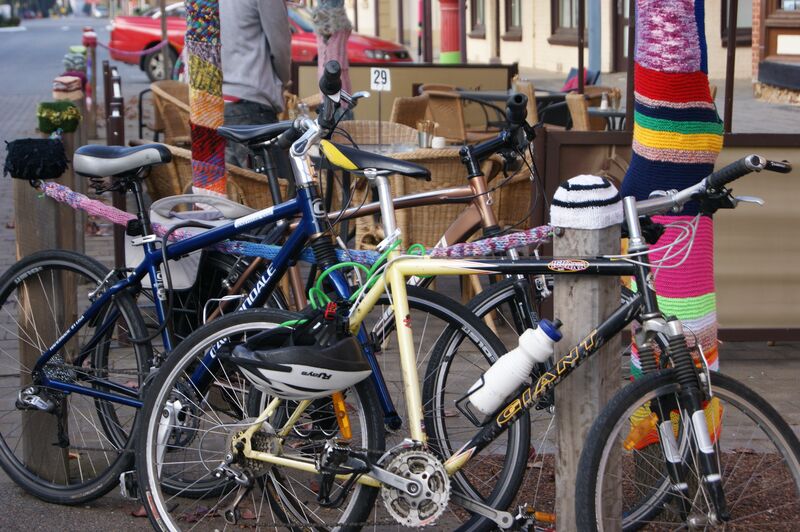 On weekends lots of people are seen wandering about with cameras and big smiles. 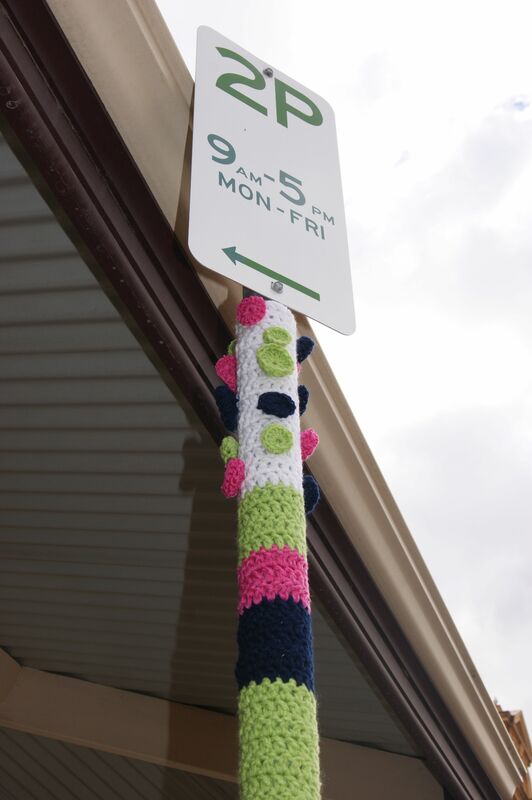 Our local yarn bombing has even made it to the paper, the 5 o’clock news and the ABC radio did an interview with auntie Pearl. 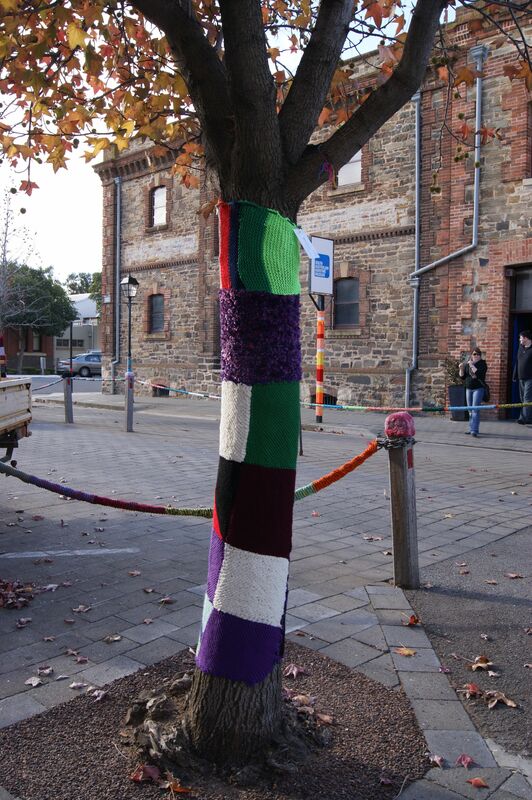 Theres even a tree covered in the local Port Power football team colours. 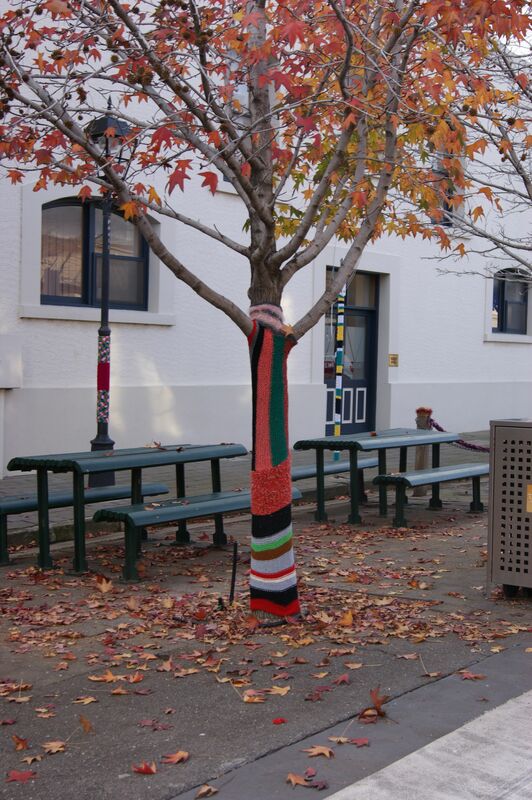 The autumn leaves set off the colours of the yarn perfectly and come spring there could be some lovely yarn blossoms. 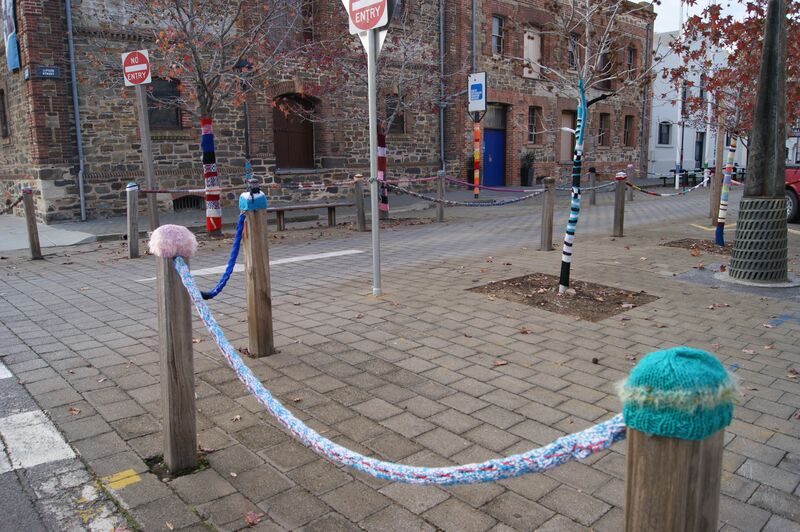 Street art and craft meld perfectly when it comes to yarn bombing. 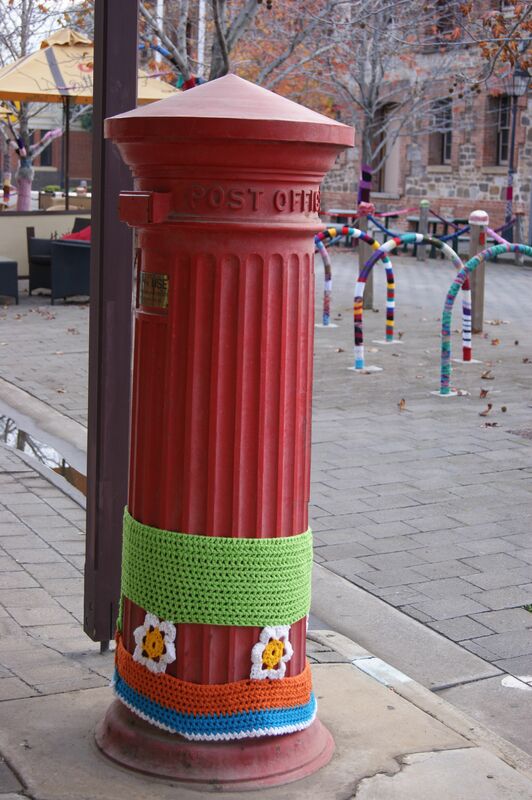 This entry was posted in crochet, knitting, Yarn bombing and tagged craft, knitted, photography, port adelaide, street art, yarn bomb, yarn bombing on June 20, 2012 by yarnbomb. 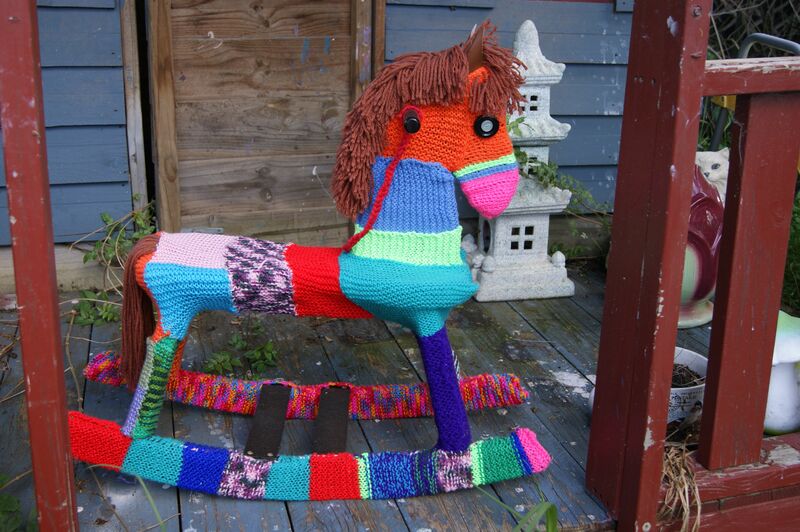 This yarn bombed rocking horse has been getting around town. 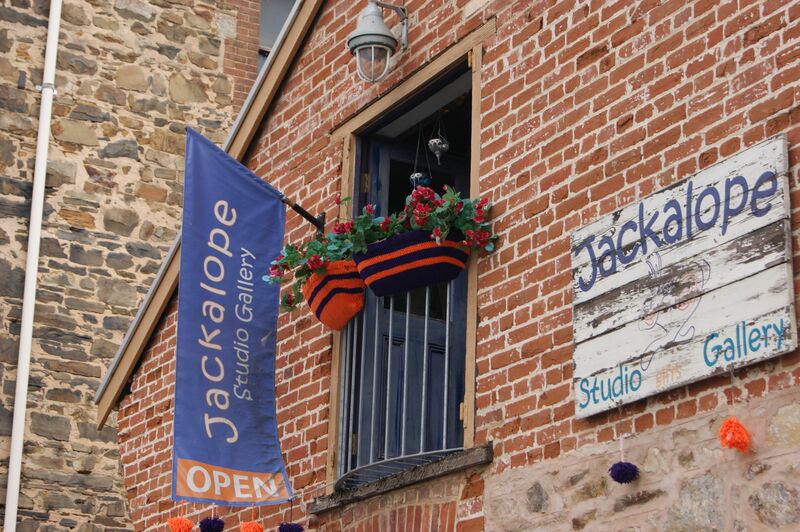 The horse was spotted rocking out over the queens birthday long weekend at Jackalope gallery in Port Adelaide. 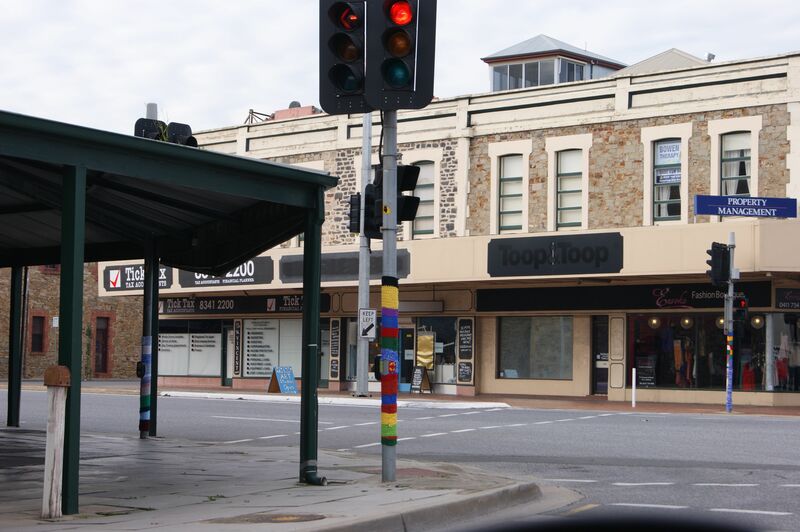 These window boxes out the front of Jackalope have been beautifully yarn bombed. 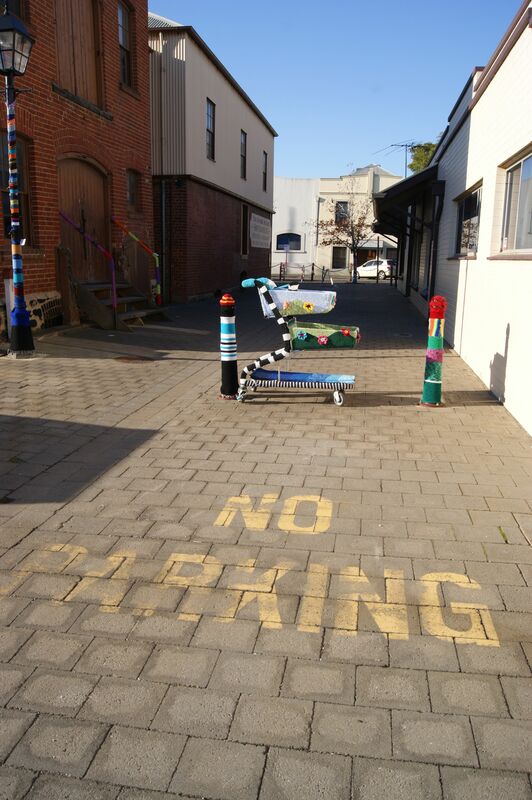 Random acts of yarn bombing just keep on happening on Lipson st Port Adelaide. I think this knit bomb bike overstayed it’s 2 hour parking limit. 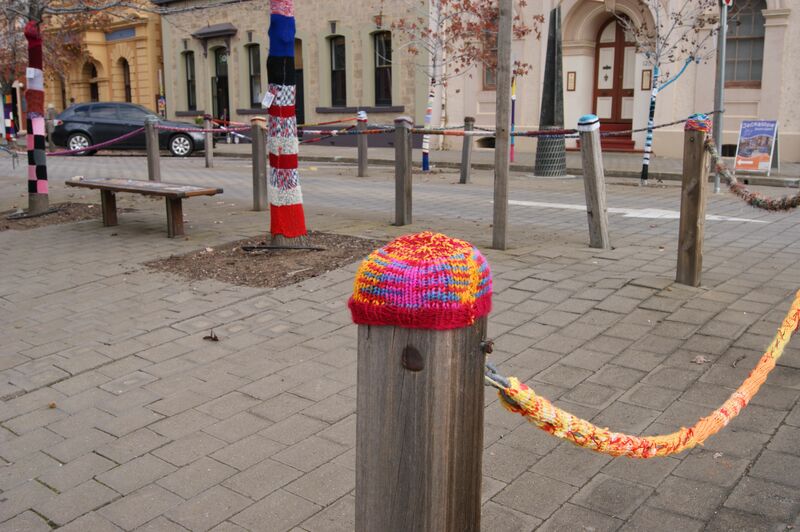 Lipson st is clean and warm thanks to a group of mystery craft enthusiasts, knitters and crochet street artists. 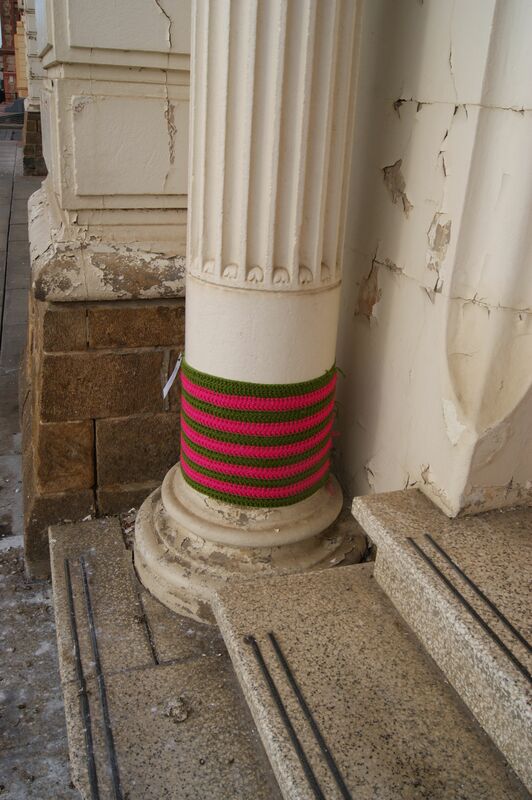 The corner pub has even caught the knitting bug. 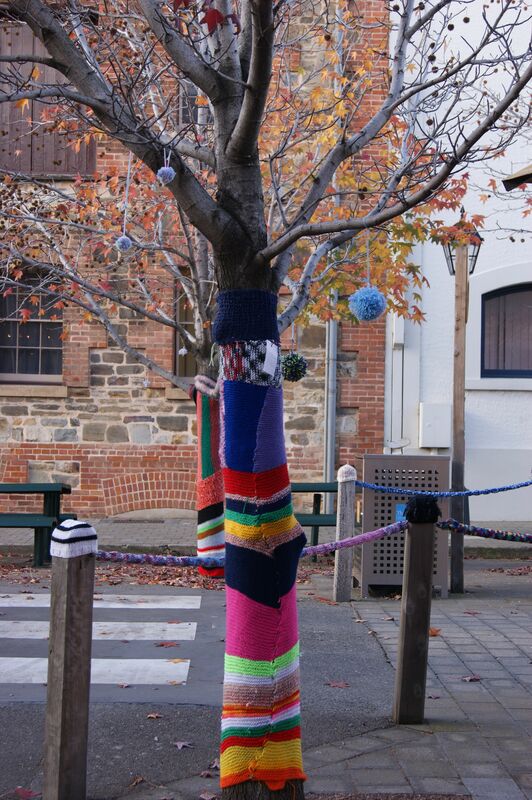 And local shoppers just can’t get enough of this yarn bombing craze. 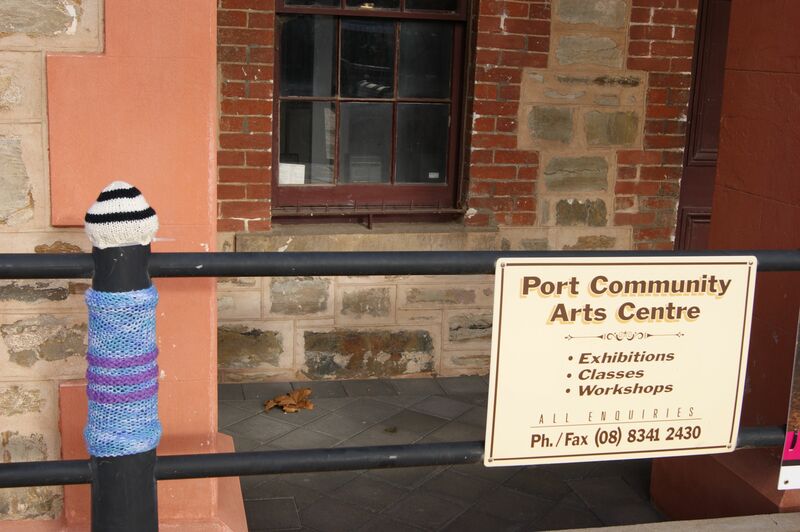 People have been flocking to Port Adelaide to check out the knitted world of the port. 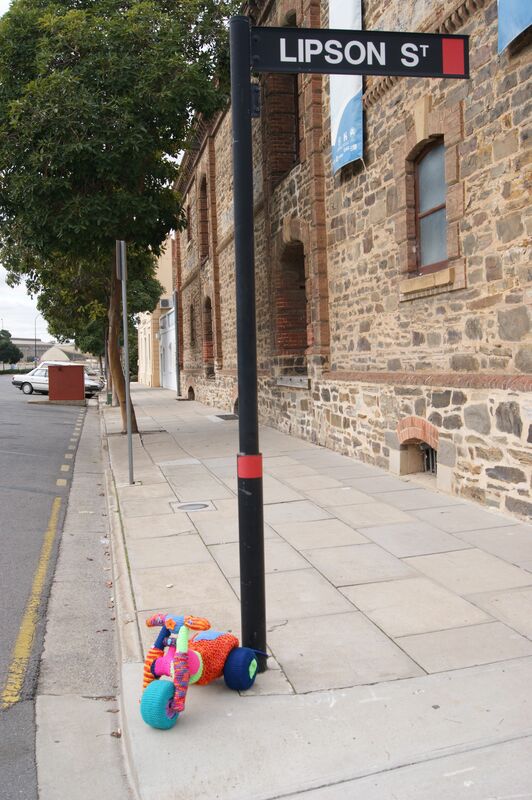 Photography is a popular pastime around Port Adelaide and no wonder when there are so many bright and wonderful things to point a camera at. 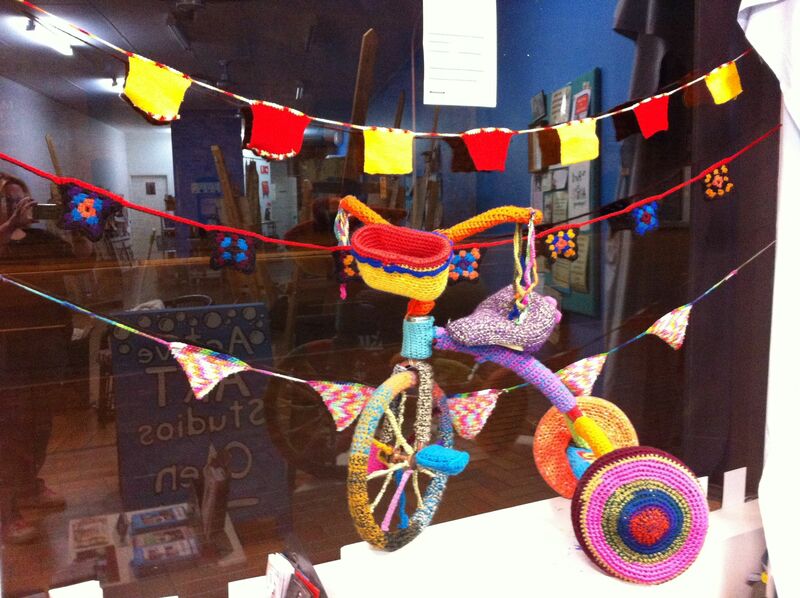 This entry was posted in bikes, crochet, knitting, photography, toys, Uncategorized, Yarn bombing and tagged craft, knitted, port adelaide, street art, yarn bombing on June 13, 2012 by yarnbomb. 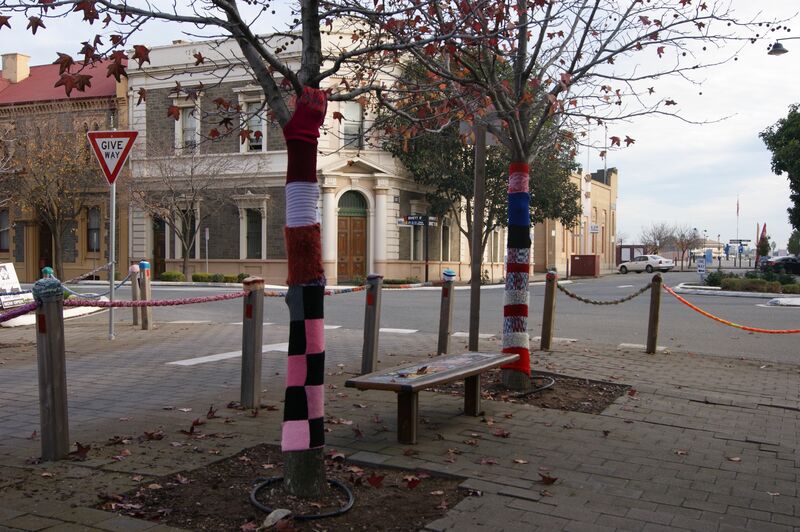 The colourful yarn bombing of Port Adelaide has had such a great reaction that the yarn fairies have resumed knitting in a bid to warm the Port for the winter months. 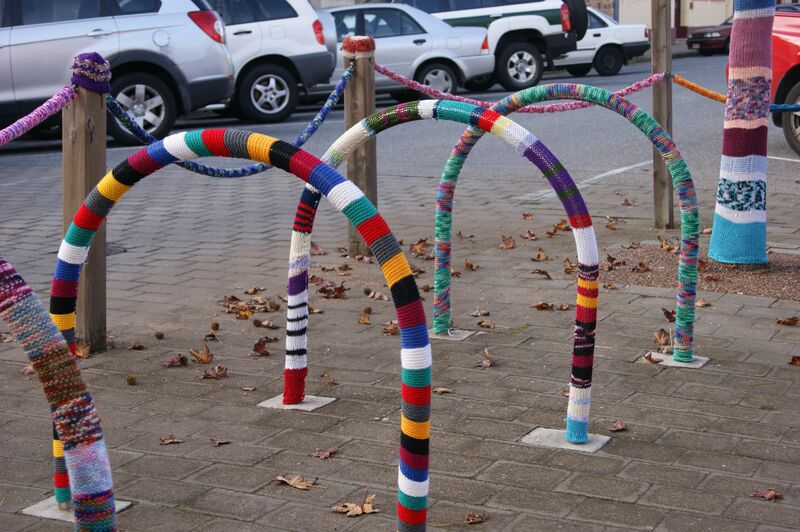 The bike racks in Lipson st look like rainbows. 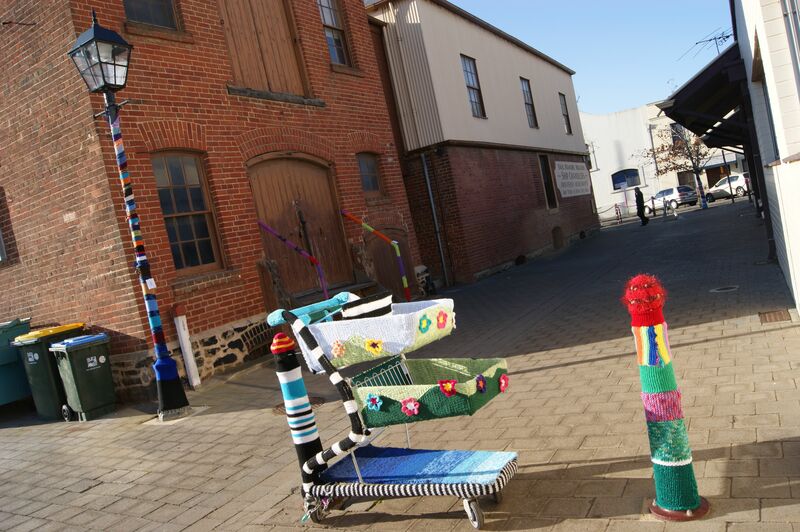 Lipson st in Port Adelaide is the place to go to see colourful yarn bombing, have a cup of tea and even visit the maritime museum. 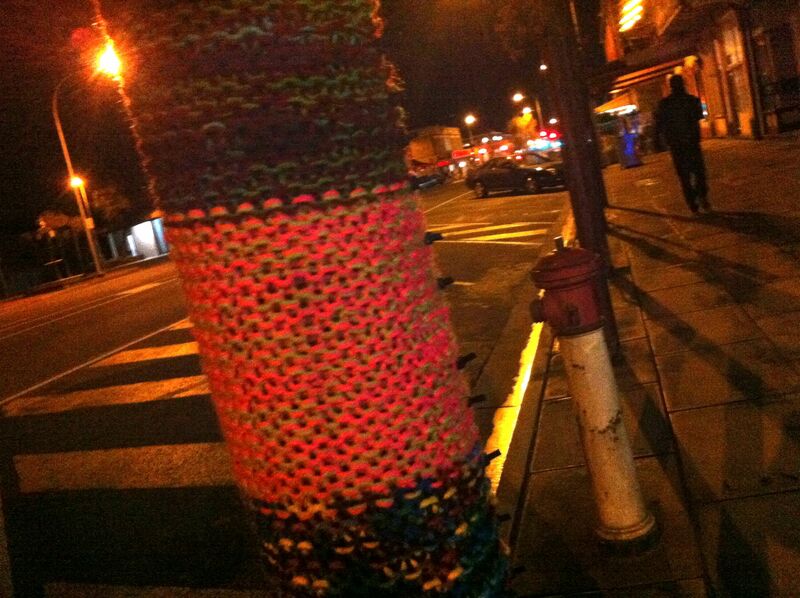 There’s so much yarn bombing going up in Lipson st that I’m half expecting to find a knitted blanket covering the entire st next time I visit. 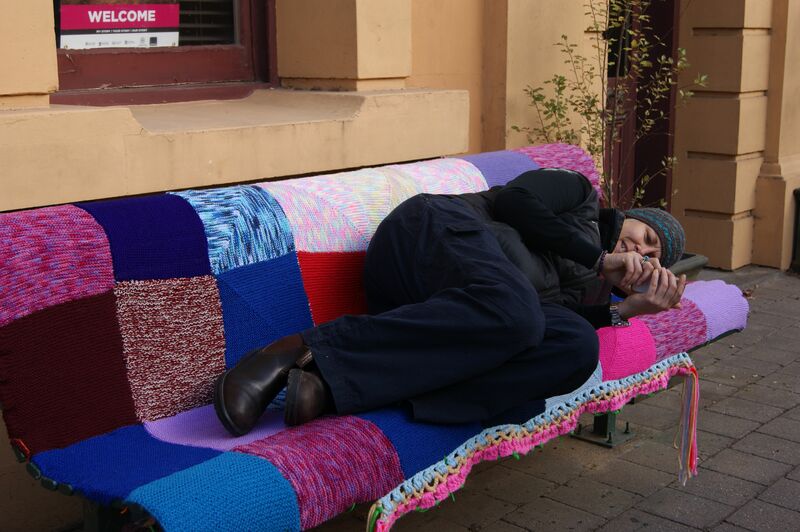 Jane Lane is no sleepy little lane! 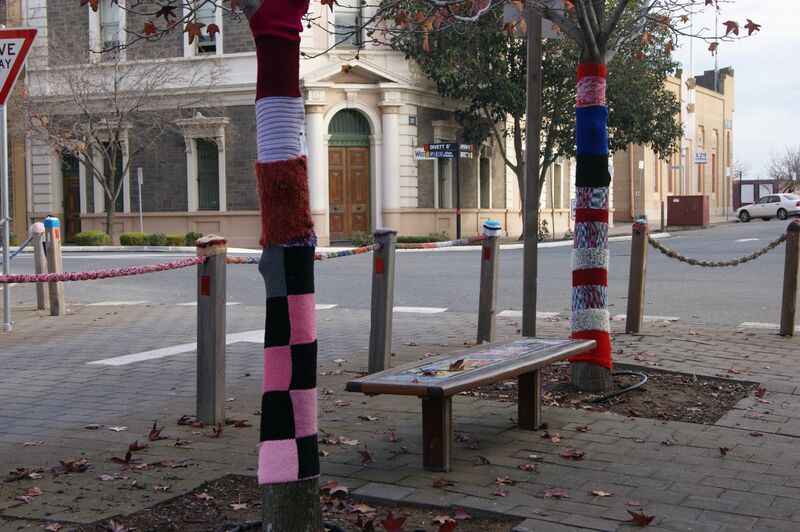 Check out the Yarn Bombing! 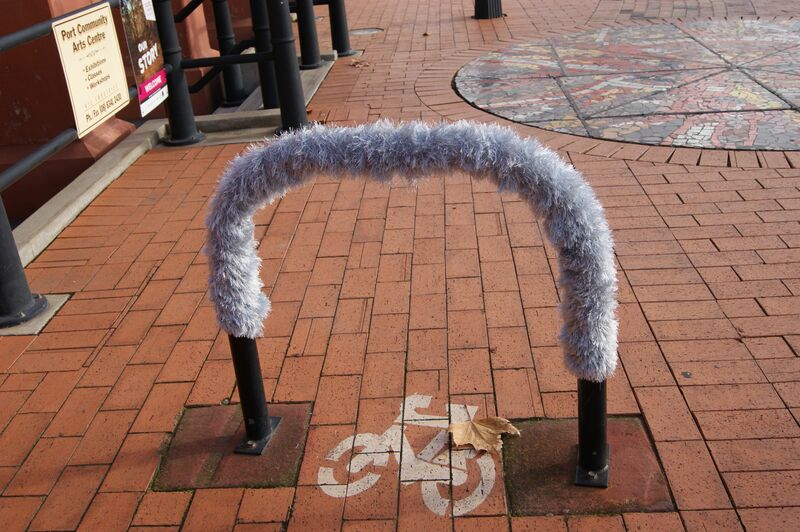 The fluffy bike rack outside of the Port Adelaide visitors centre is practical and soft to the touch. 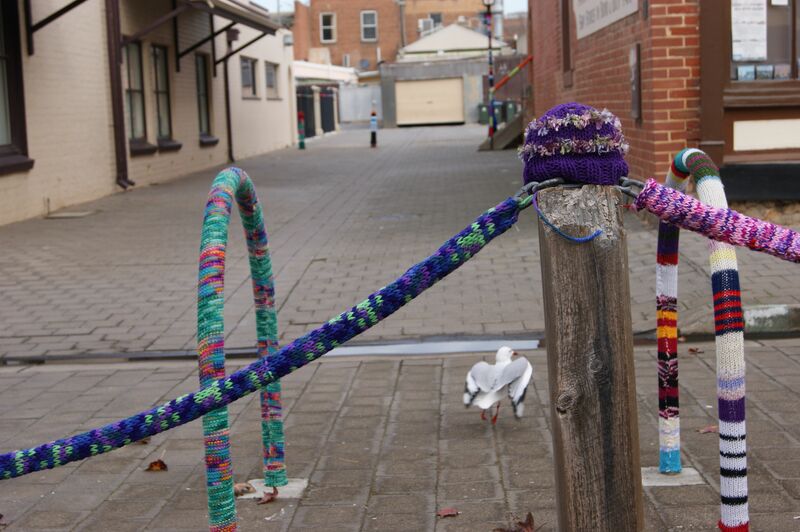 Art and craft is alive in Port Adelaide. 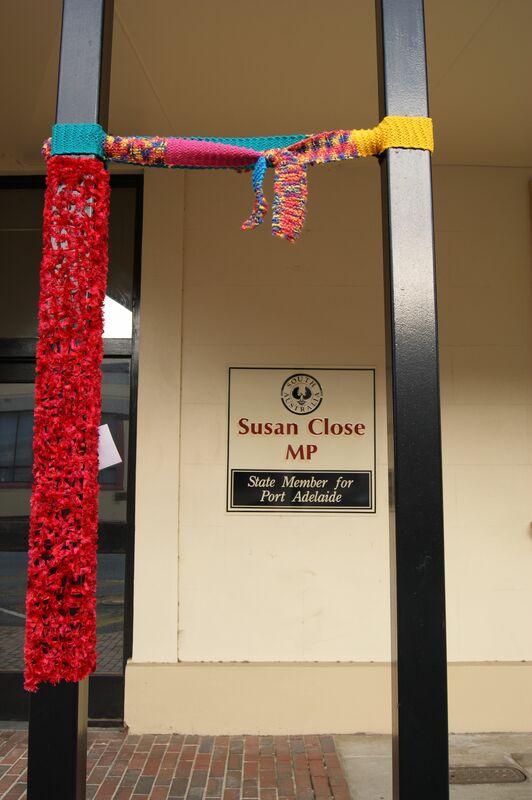 Even our local MP has been yarn bombed. 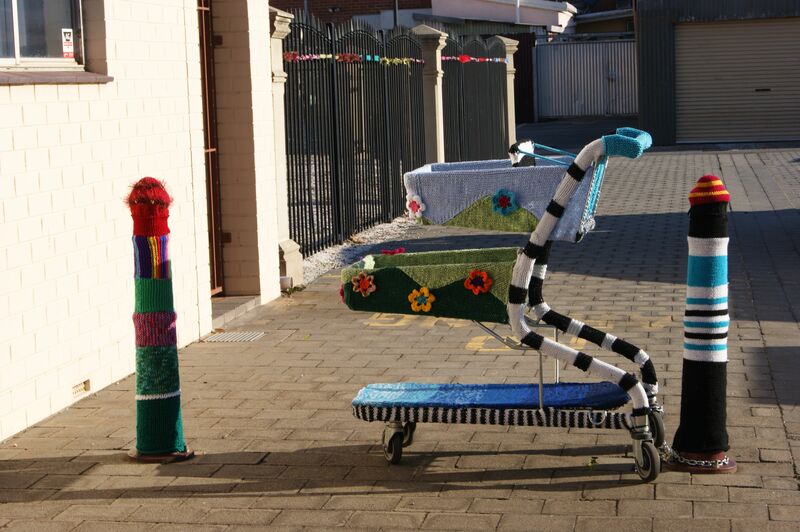 If you like photography head on down to the port and take a few photographs of the yarn bombing and keep an eye on this space for more yarn bomb updates. 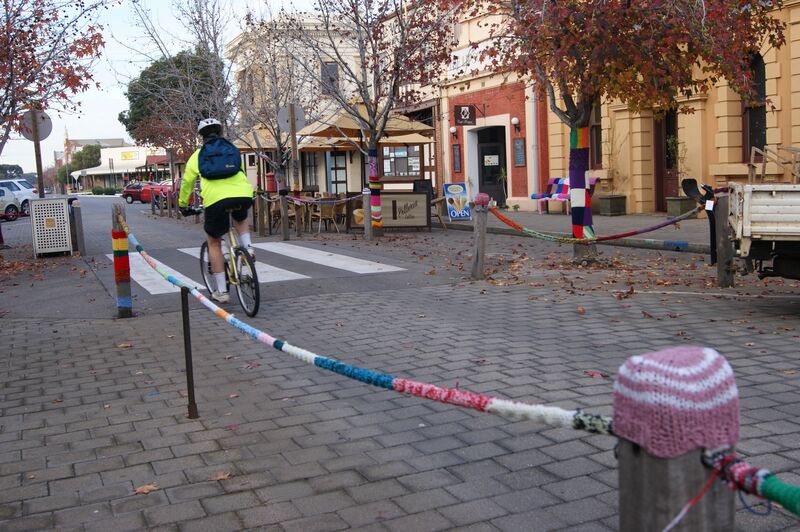 This entry was posted in bikes, Yarn bombing and tagged art, craft, knitting, photography, port adelaide, yarn bomb, yarn bombing on June 5, 2012 by yarnbomb. 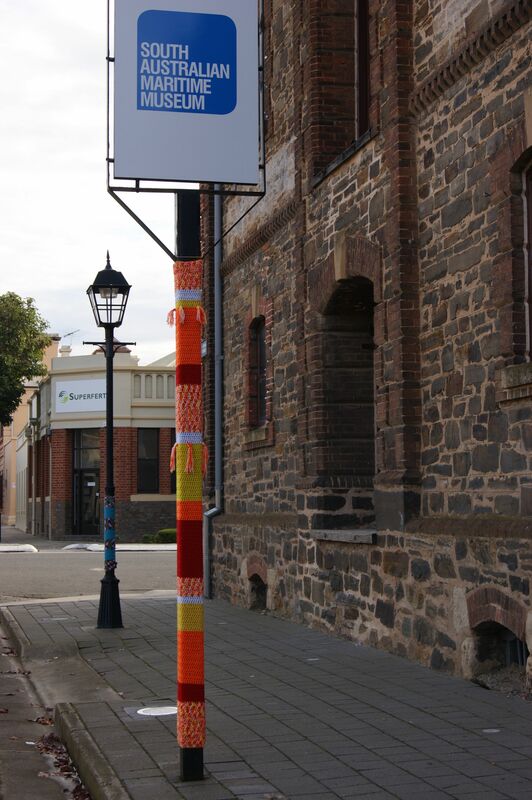 After the mega yarn bombing of Port Adelaide on friday night, I returned to the scene of the crime in the light of day to indulge in some photography. 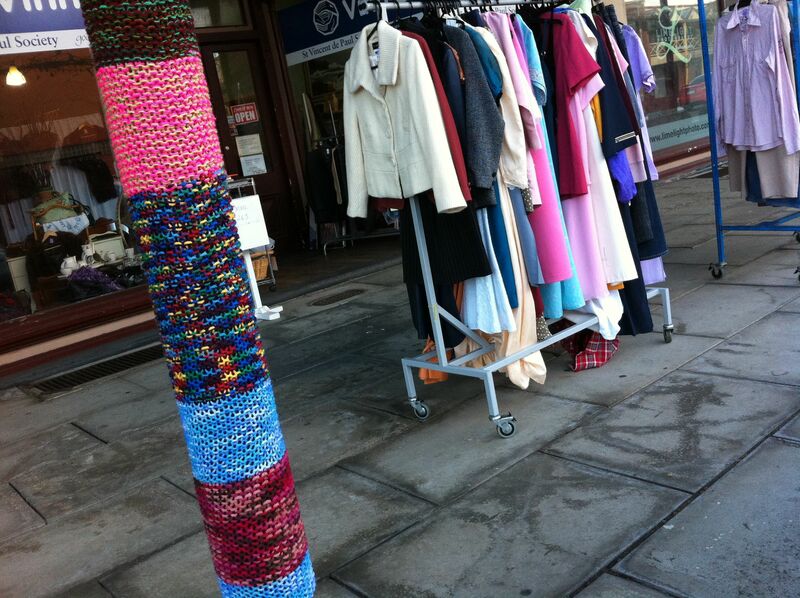 This great street scene is craft gone mad in the local community. 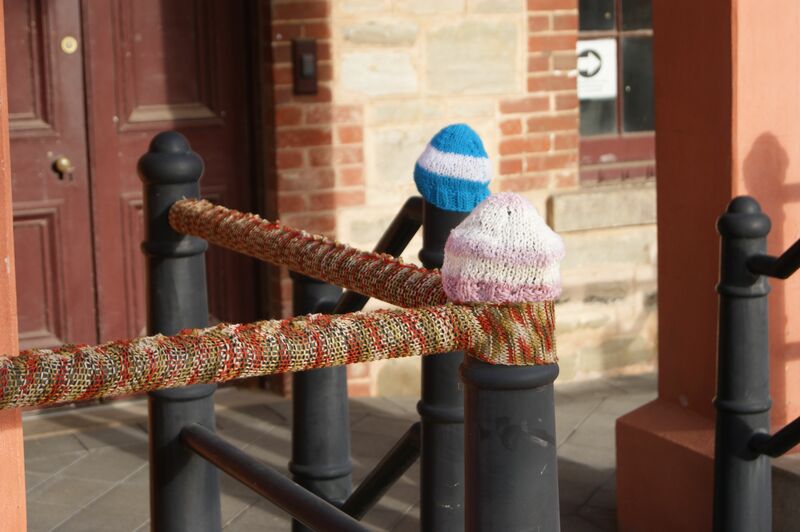 As the Australian winter is coming on a group of kindly community members have been knitting and performing feats of crochet to warm Port Adelaide. 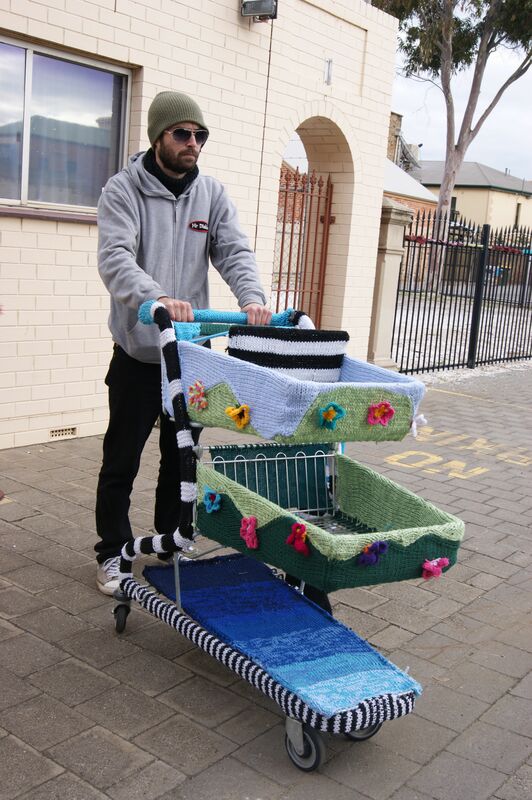 Shopping with a yarn bombed shopping trolley is the only way to shop. 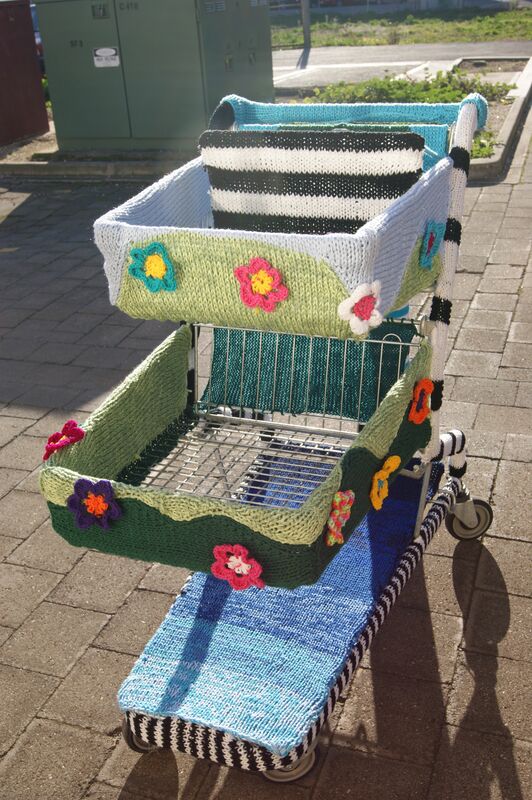 I’d like to take this trolley with me to my local spotlight or craft store. 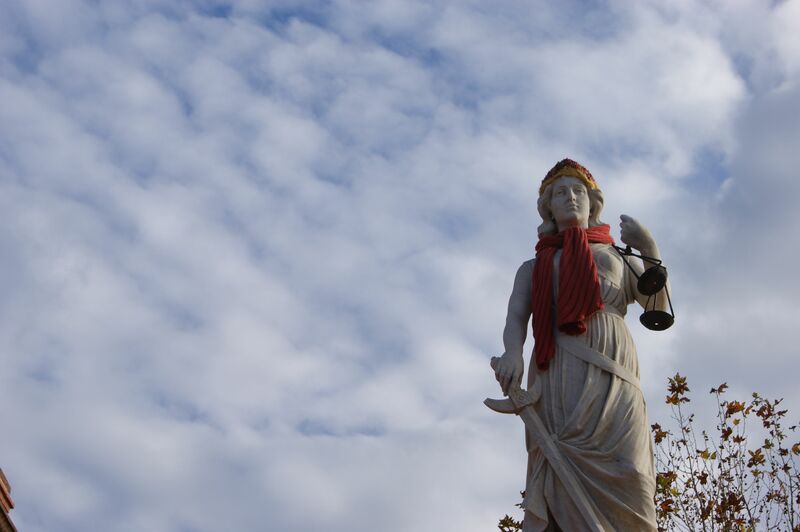 The statue did it !!!! 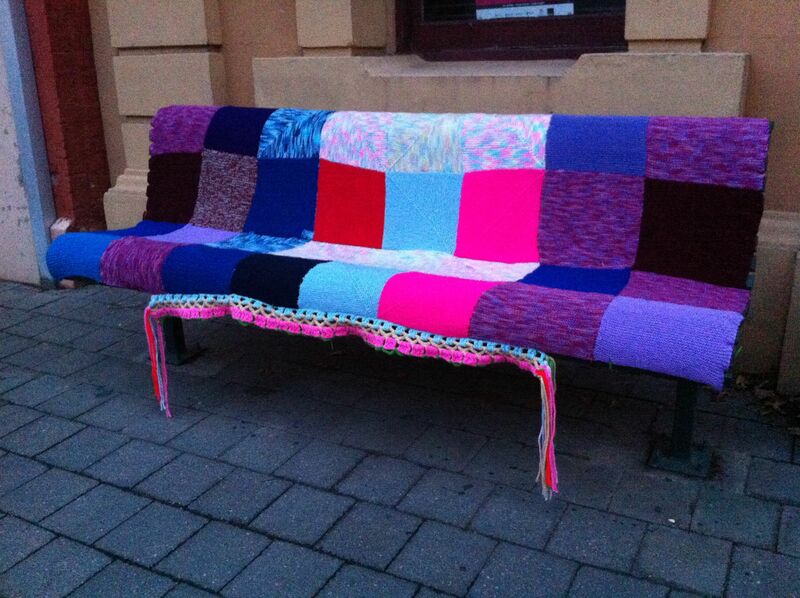 The most comfortable bench in Adelaide. 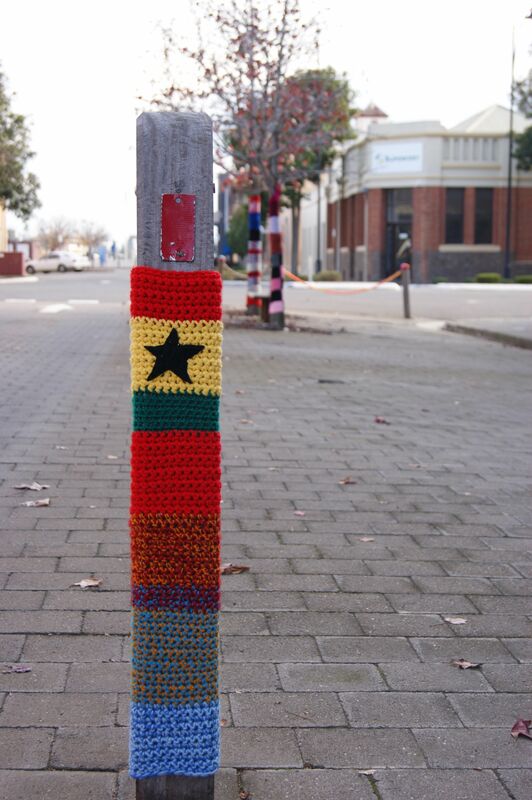 The best looking pole in Australia. 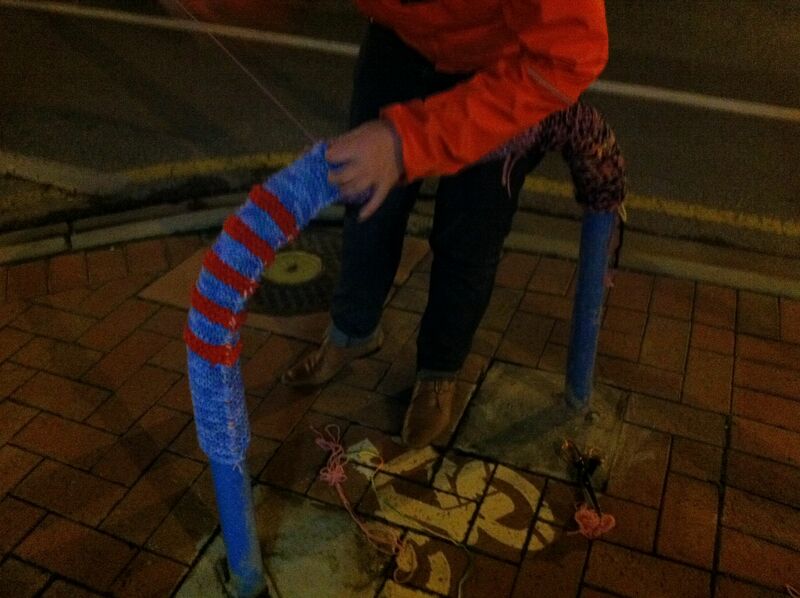 Stay tuned for more yarn bombing, craft, art and photography. 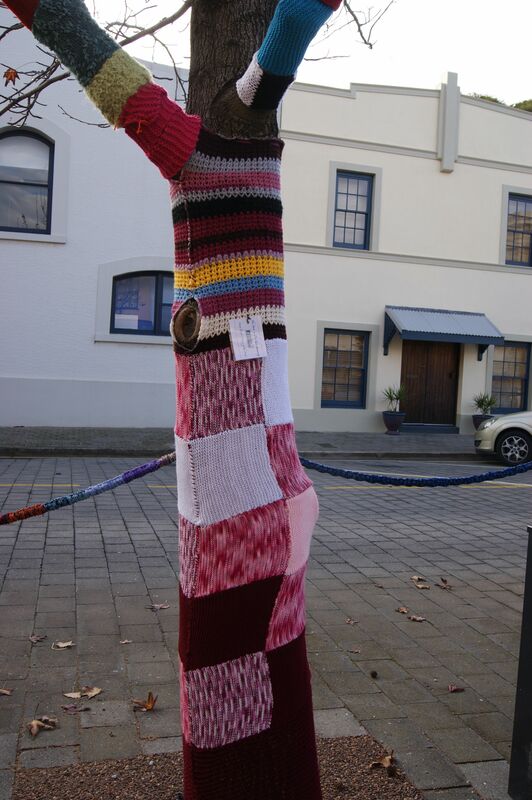 This entry was posted in Yarn bombing and tagged community, craft, crochet, knitting, photography, yarn bombing on June 2, 2012 by yarnbomb. 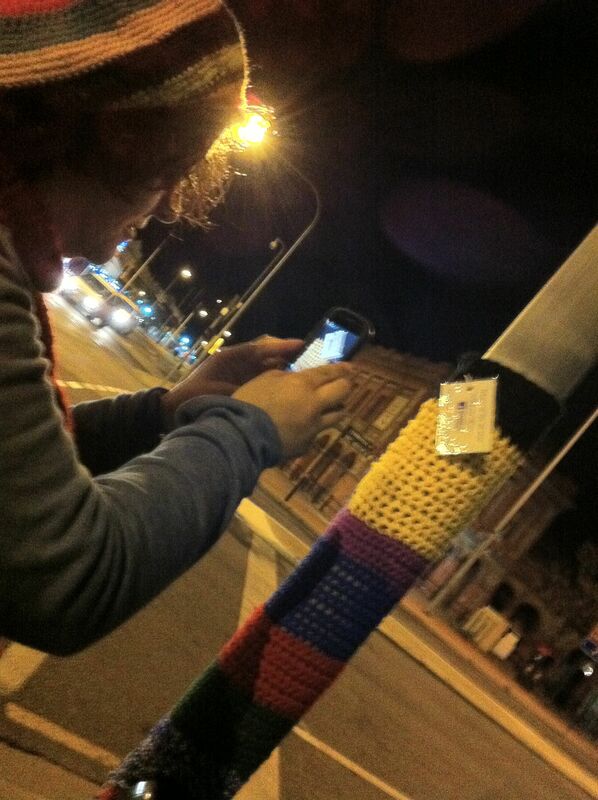 Friday night a mysterious group of ladies was spotted yarn bombing Port Adelaide. 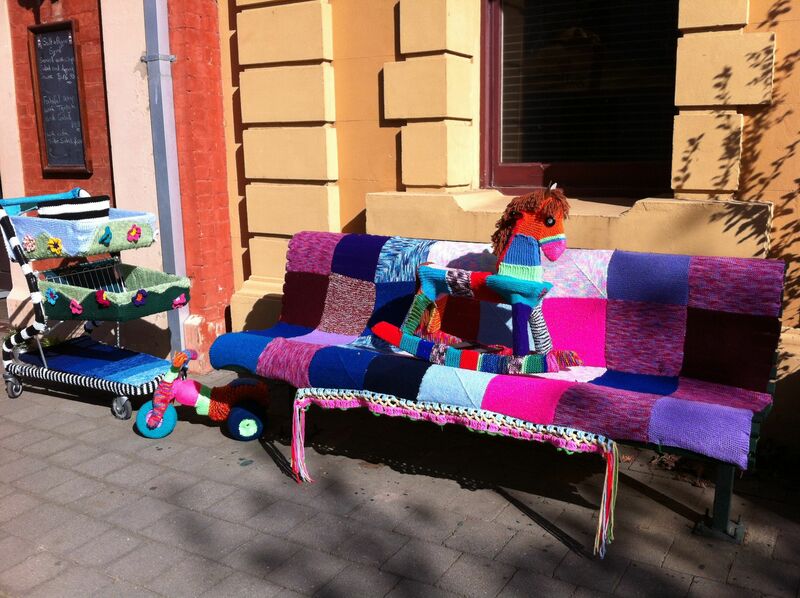 They started with this vibrant park bench. 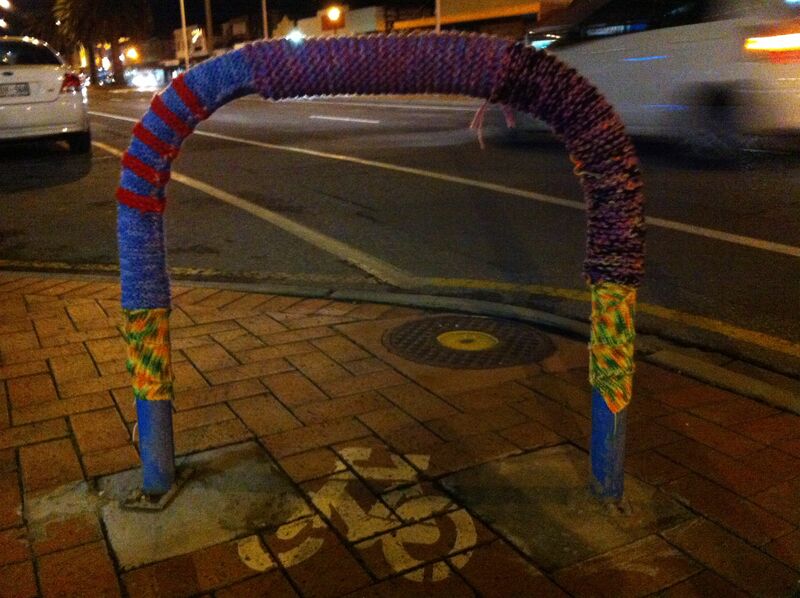 This bike rack was yarn bombed by two ladies who disappeared into the night. 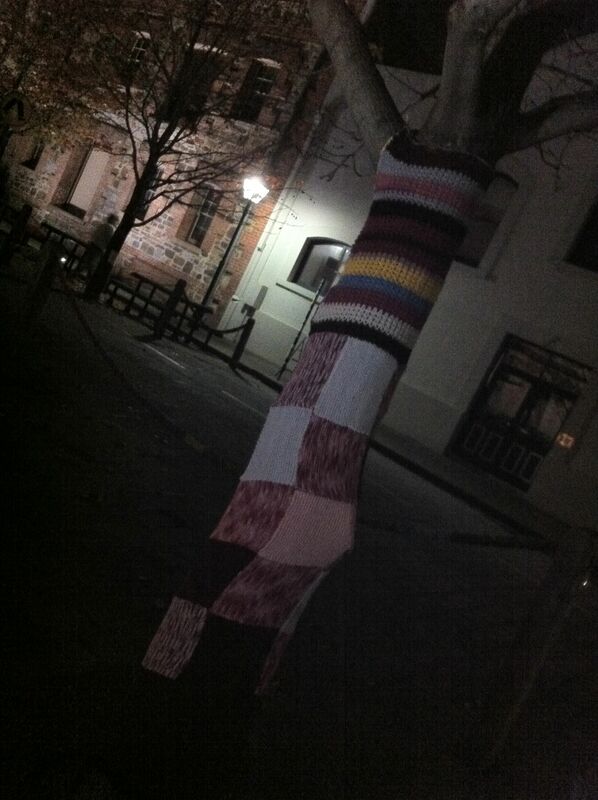 Even the tree’s were targeted by yarn bombers. 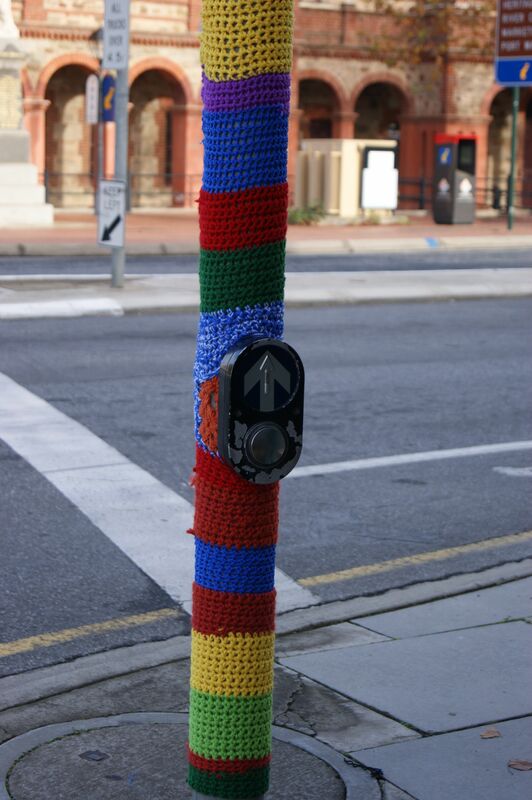 The traffic lights look great in multi coloured crochet. 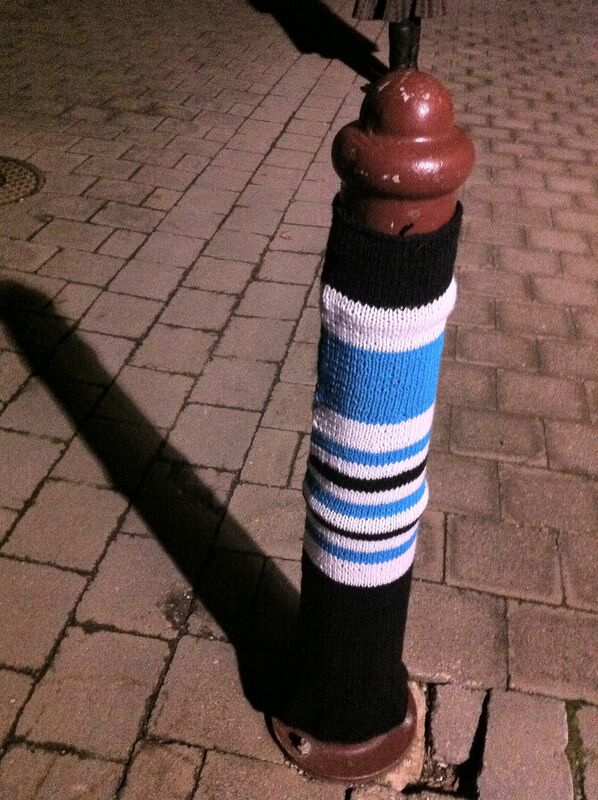 This bollard has been yarn bombed with local football colours. 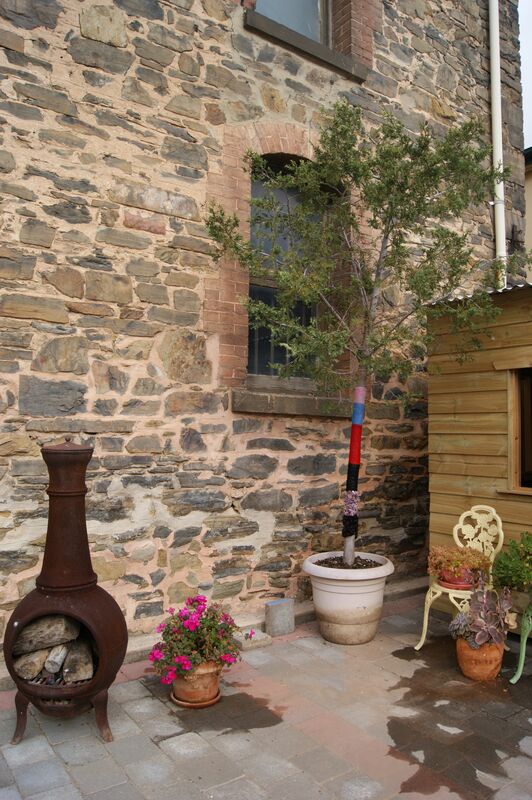 Keep your eye on this space! 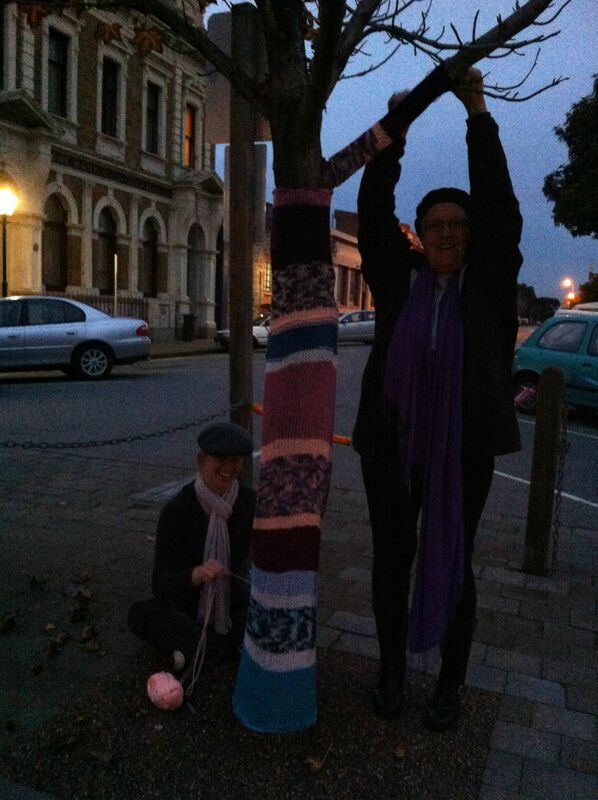 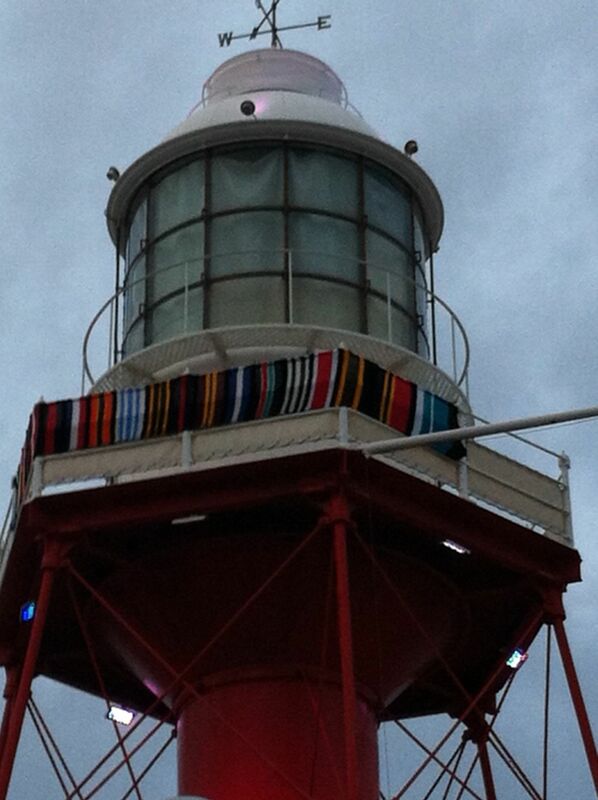 tomorrow I plan to get a lot of day time photographs of yarn bomb craft in Port Adelaide. 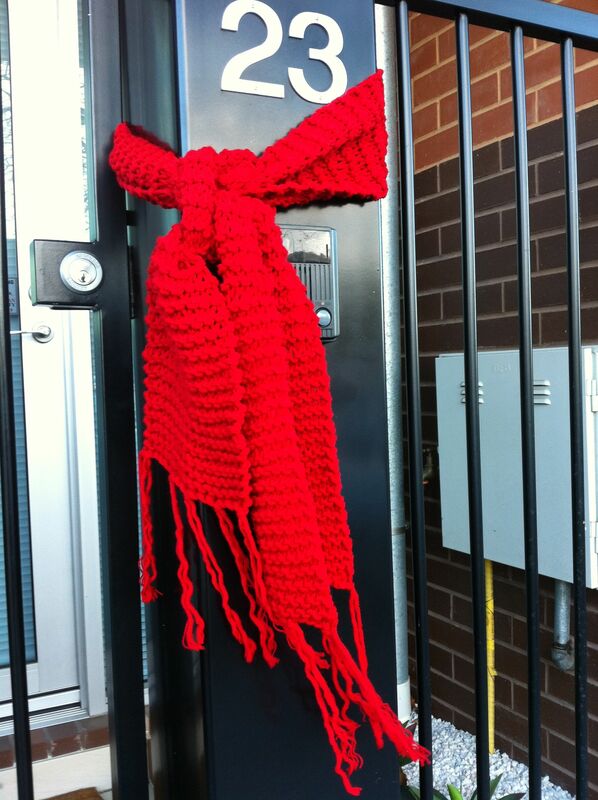 This entry was posted in Yarn bombing and tagged craft, crochet, yarn bombed, yarn bombers, yarn bombing on June 1, 2012 by yarnbomb.